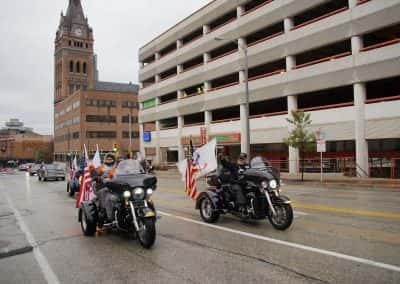 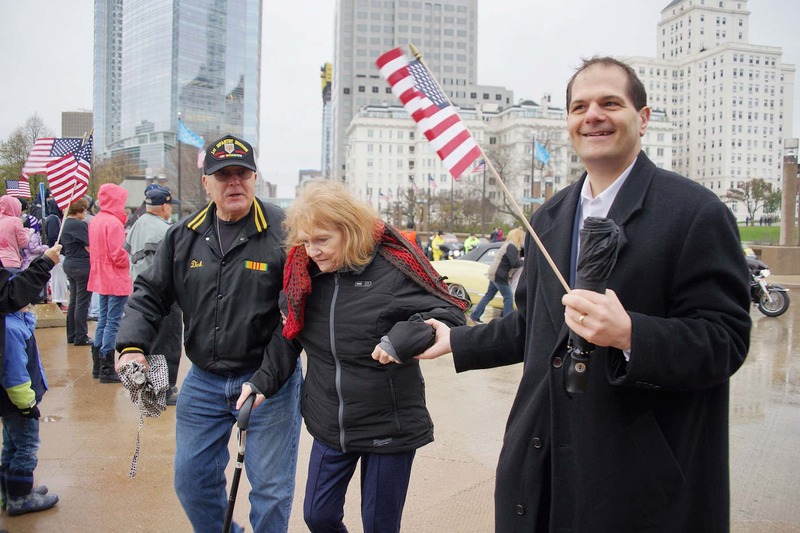 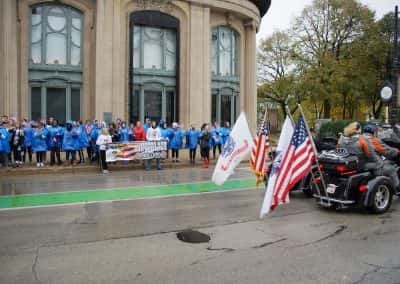 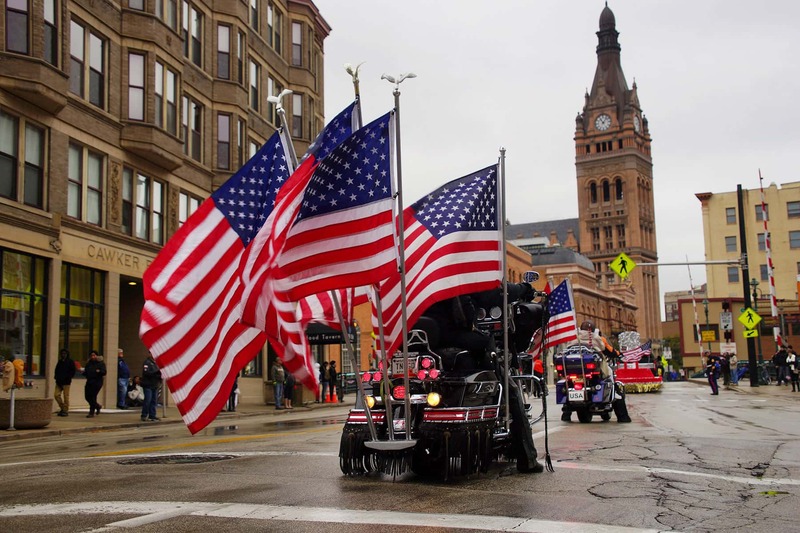 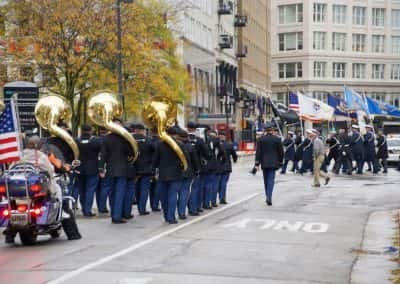 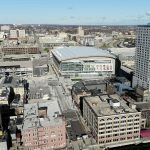 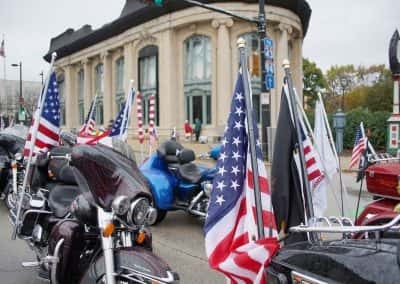 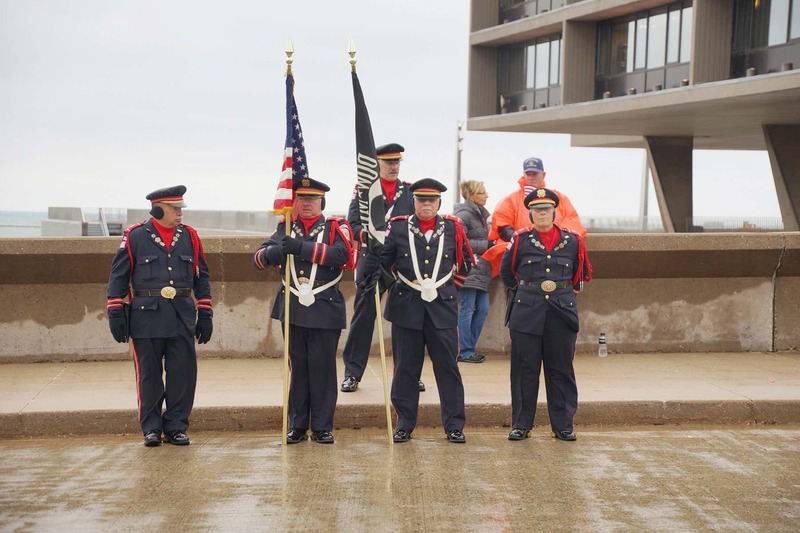 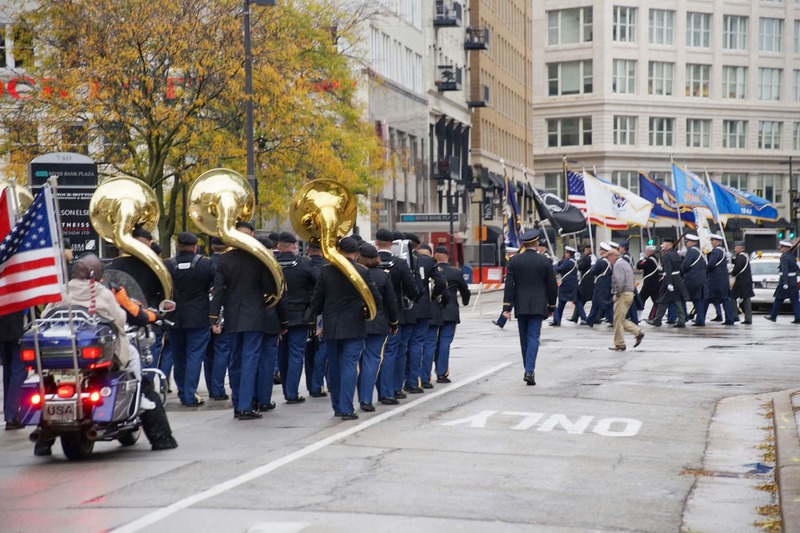 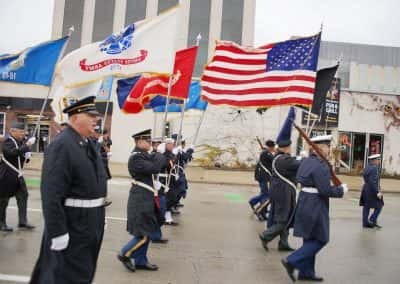 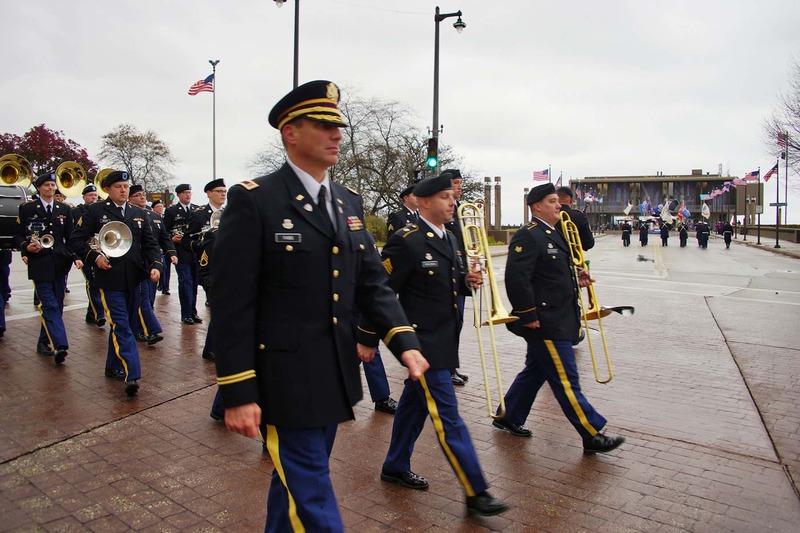 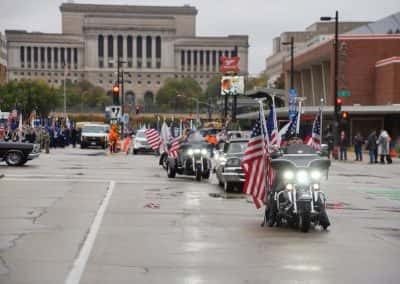 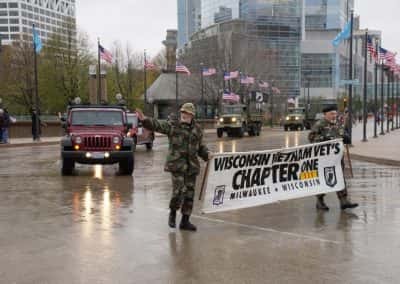 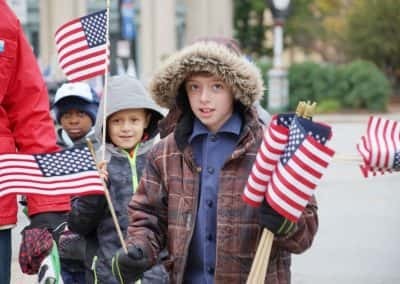 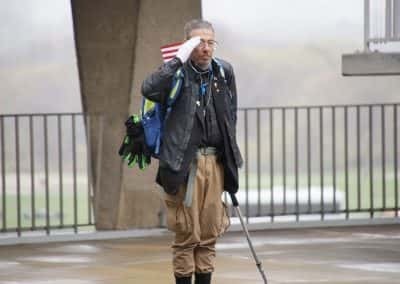 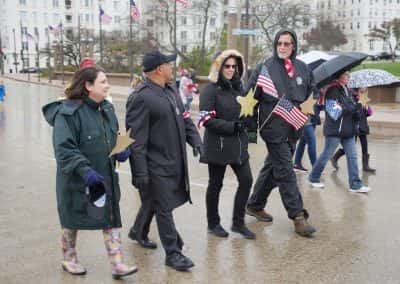 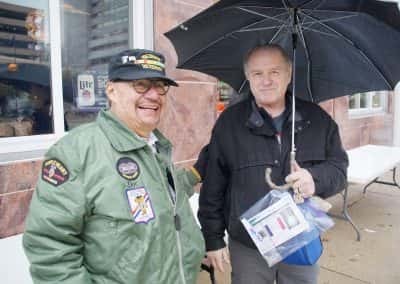 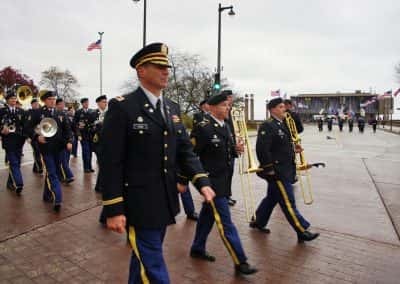 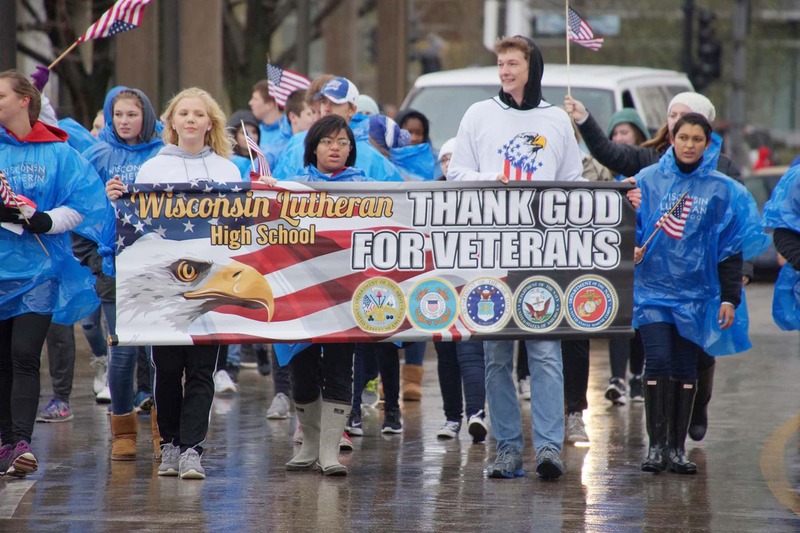 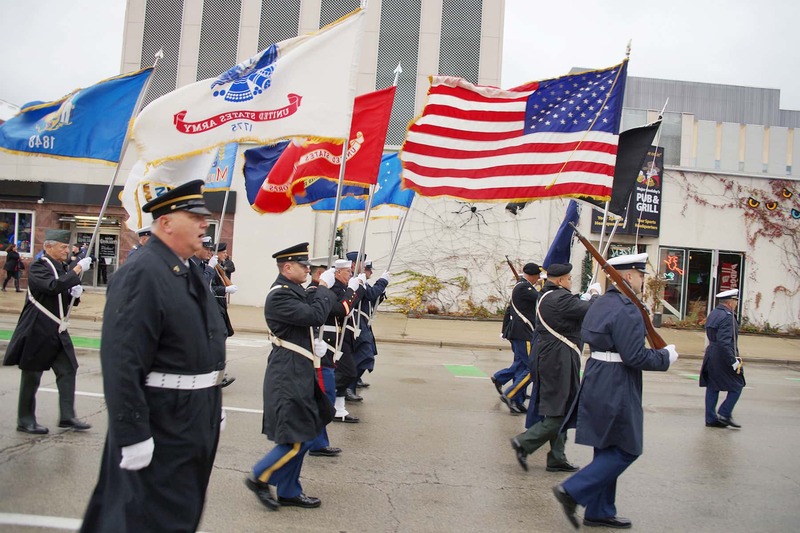 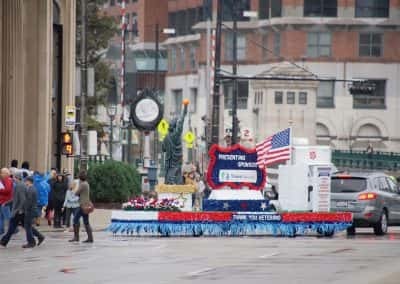 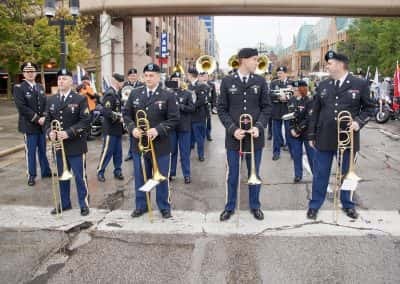 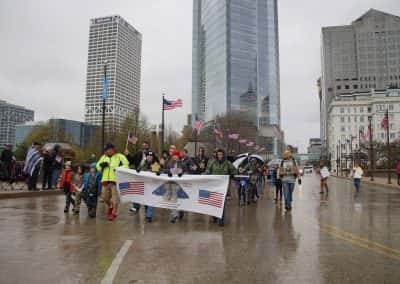 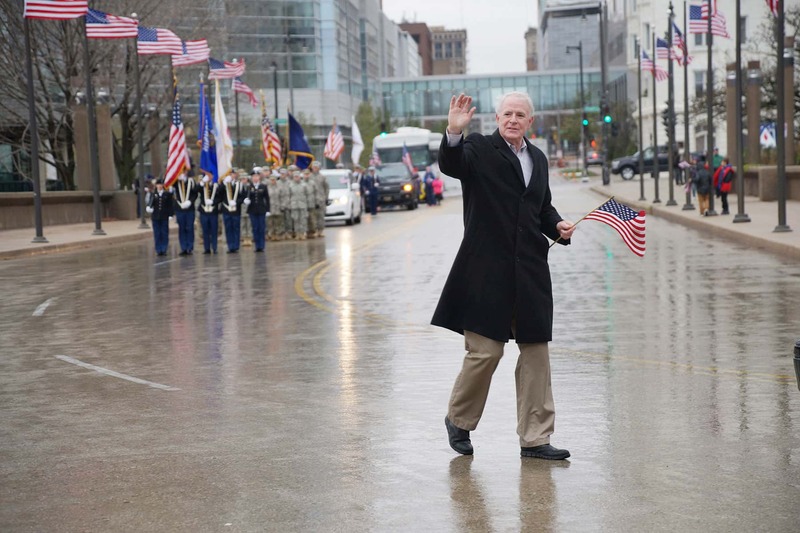 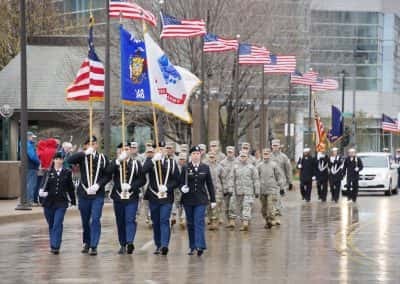 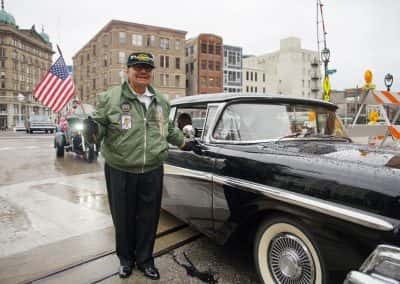 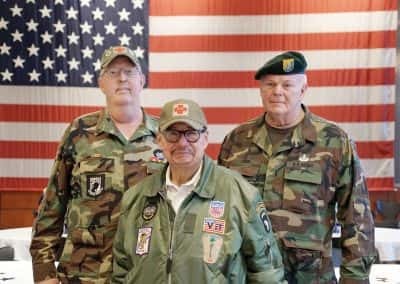 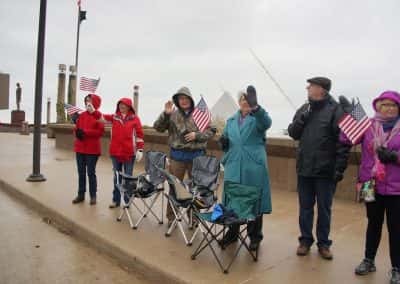 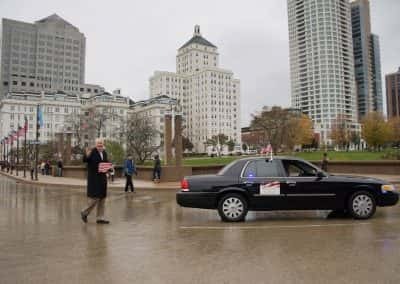 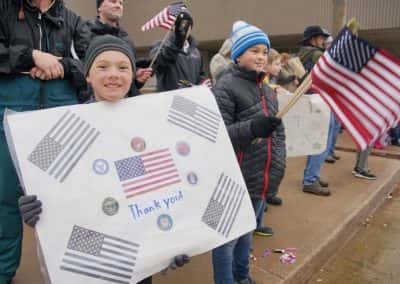 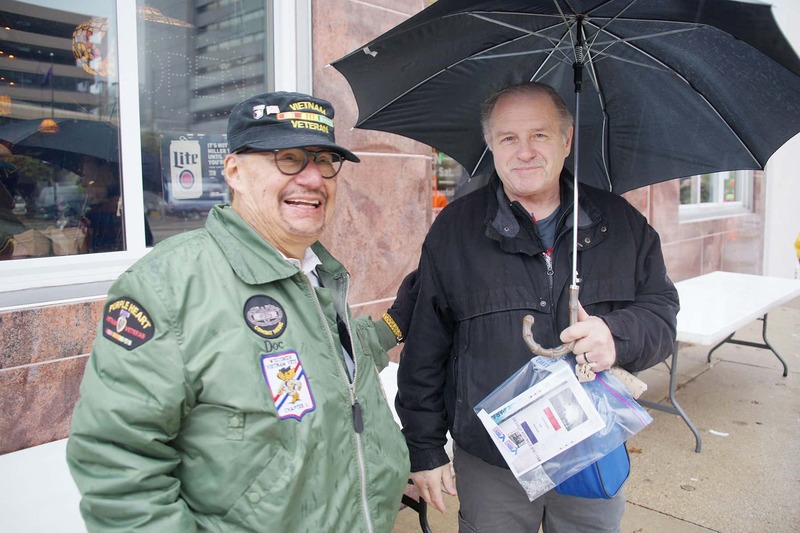 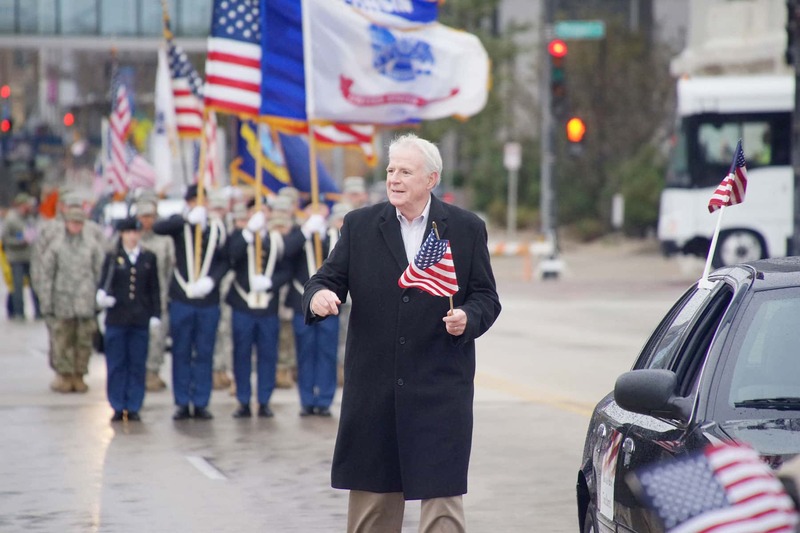 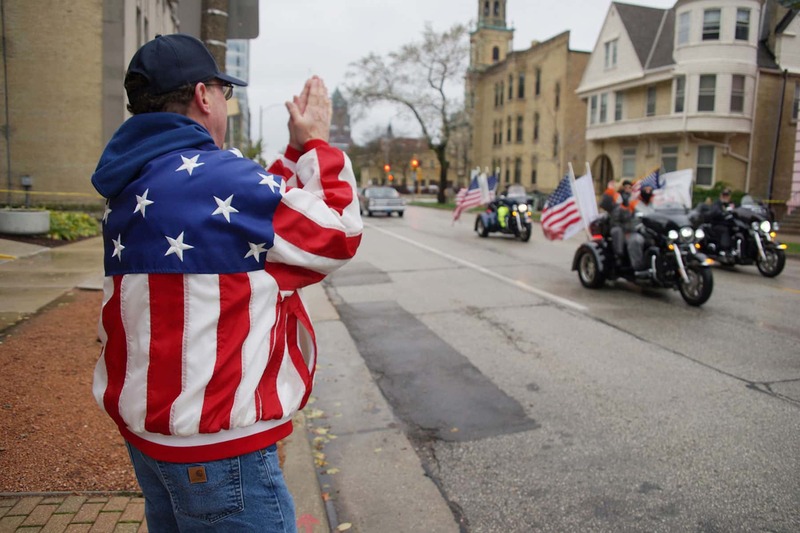 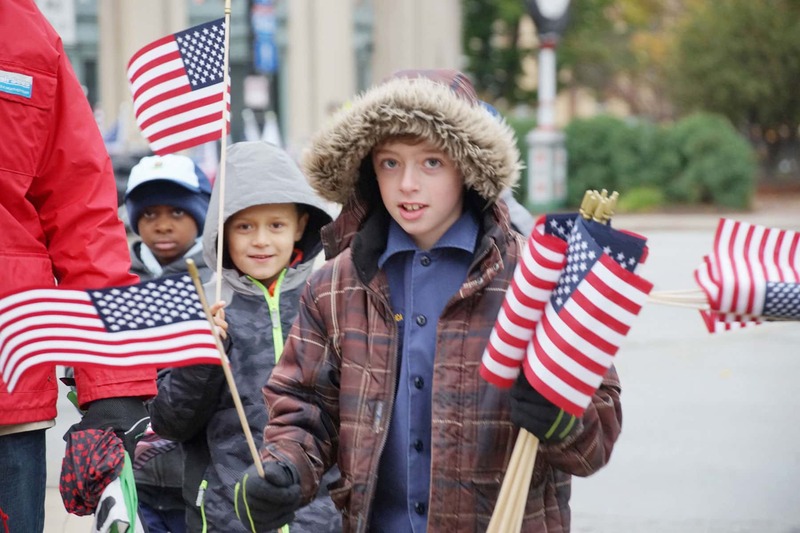 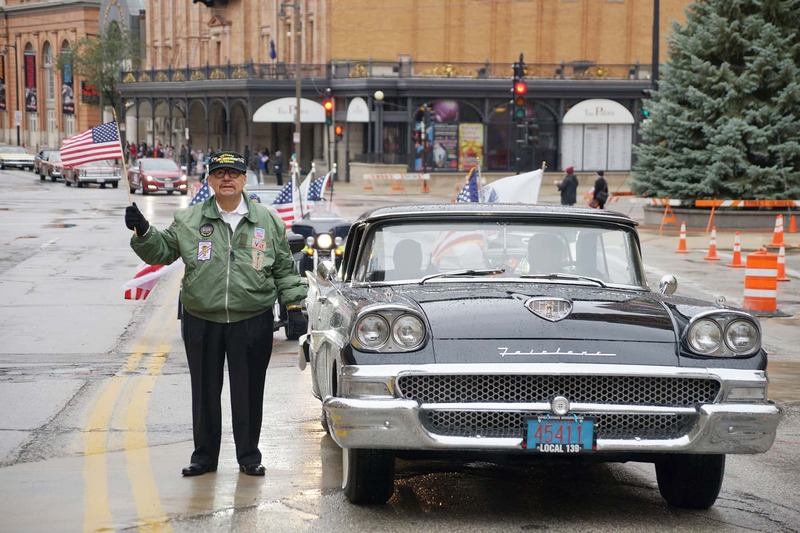 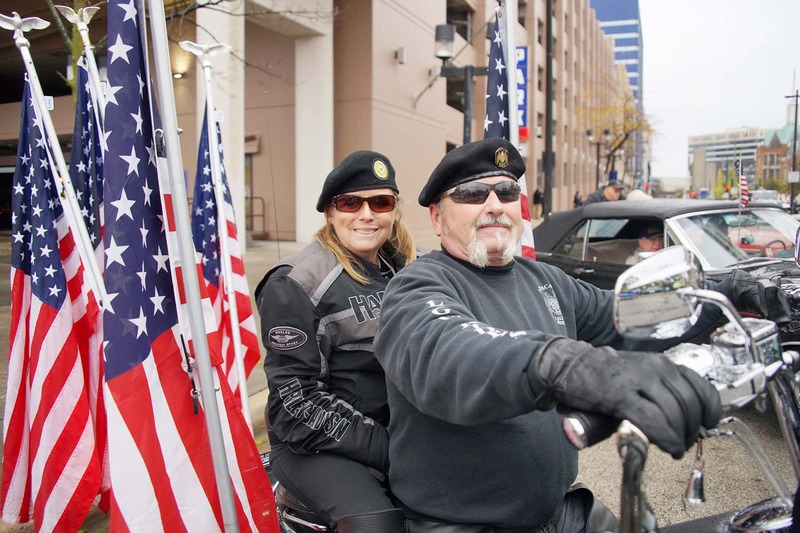 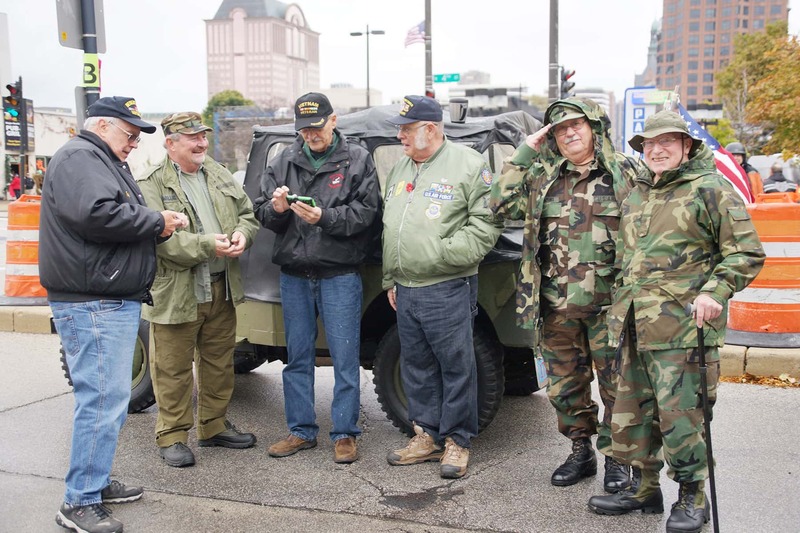 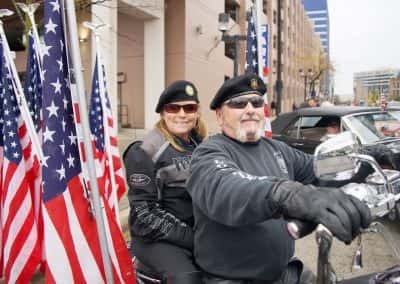 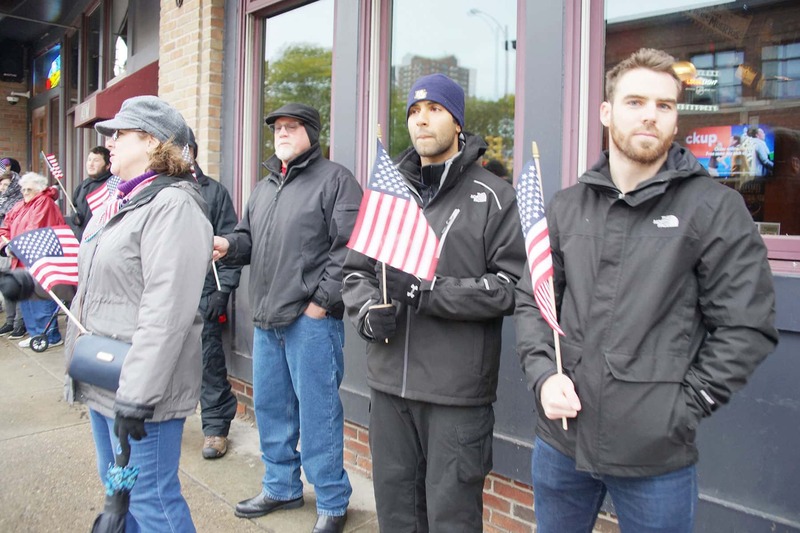 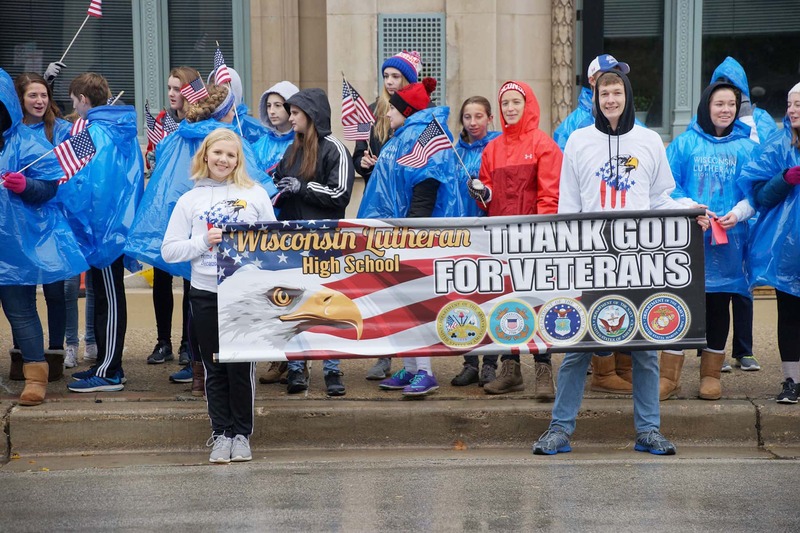 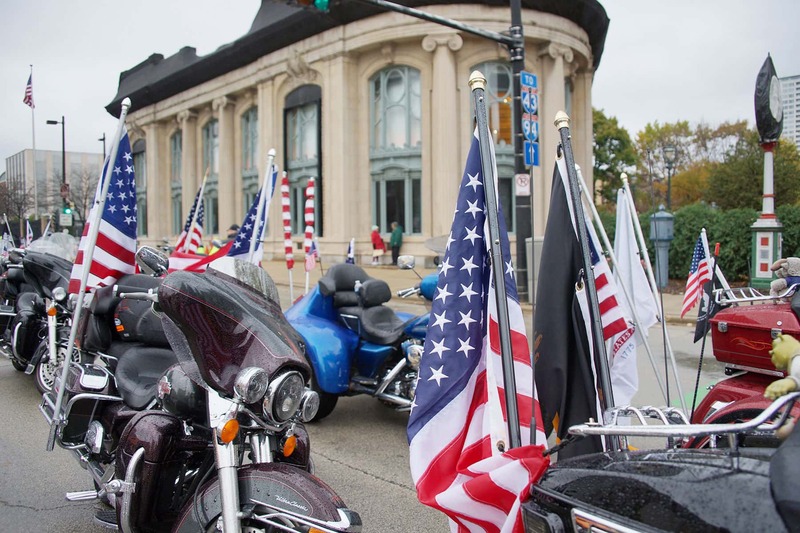 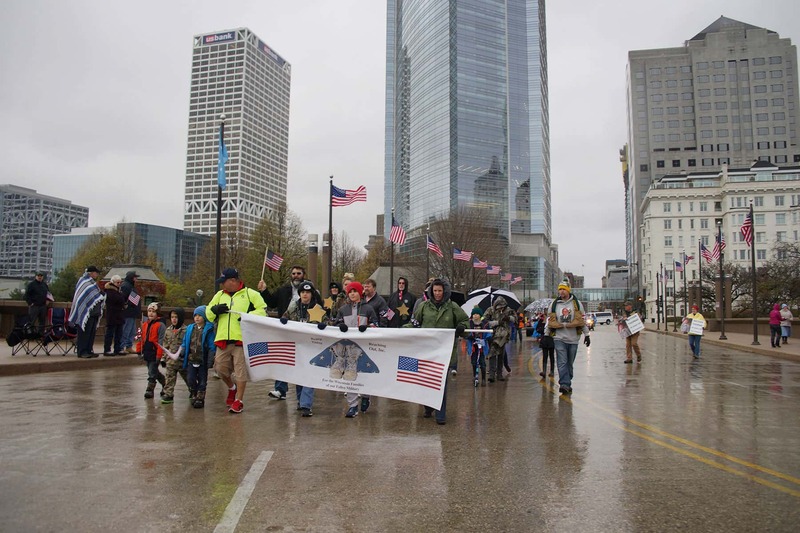 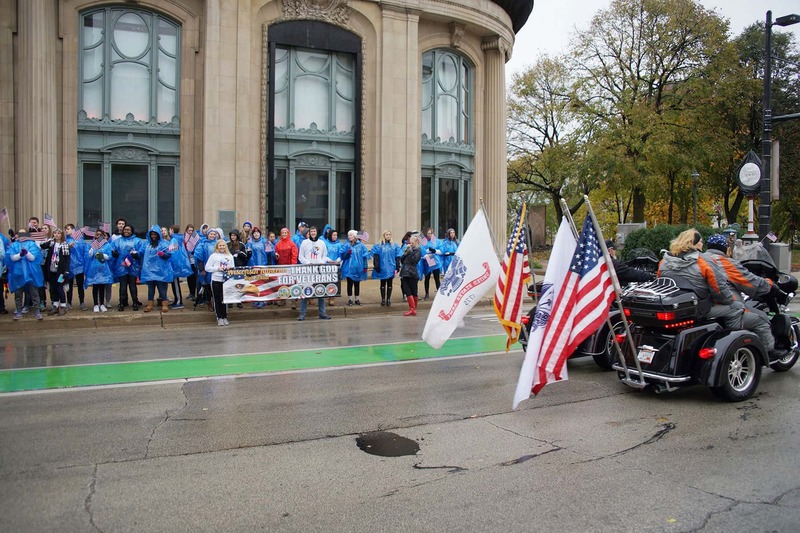 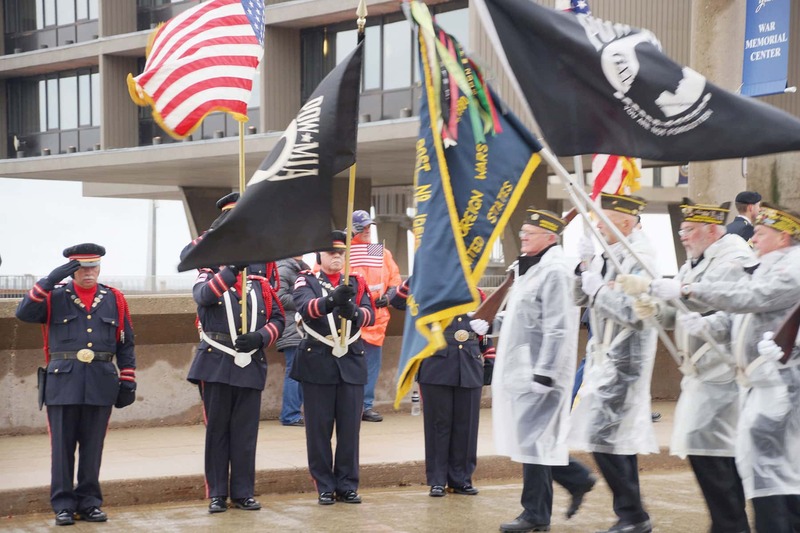 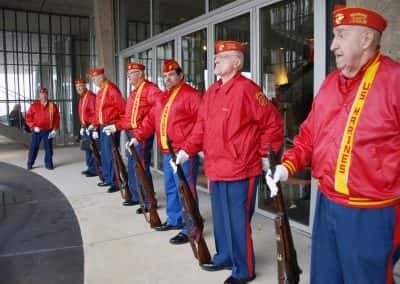 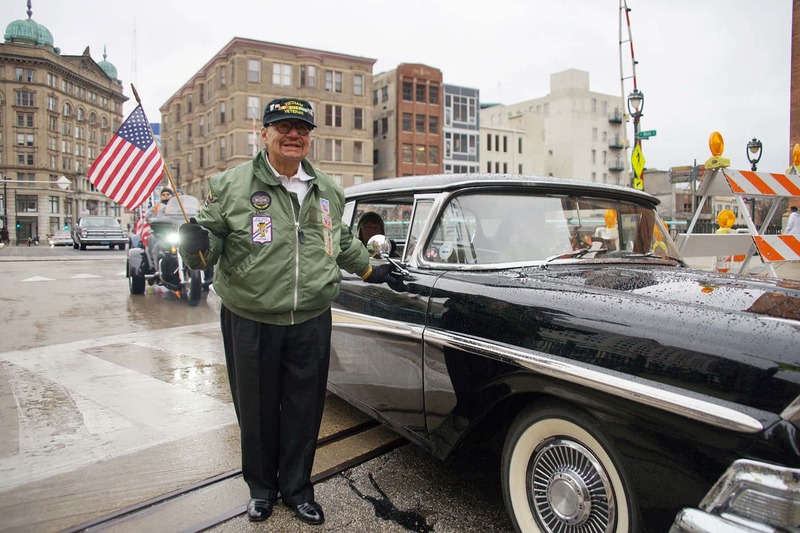 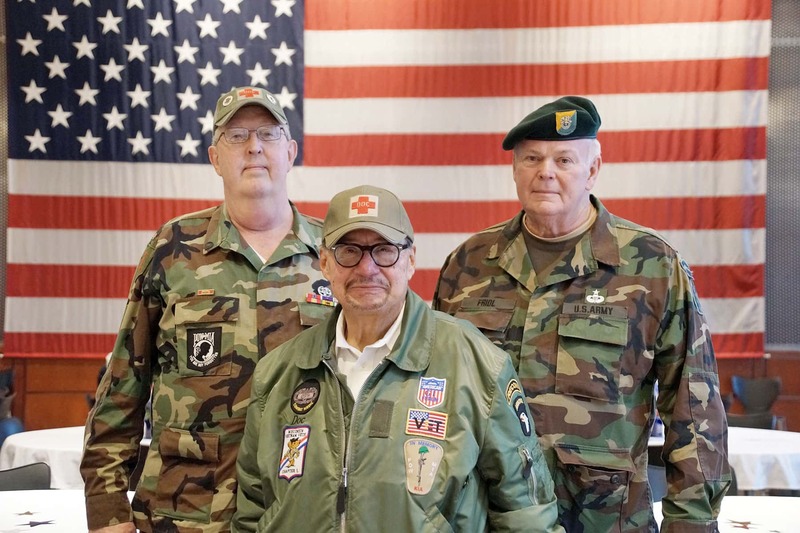 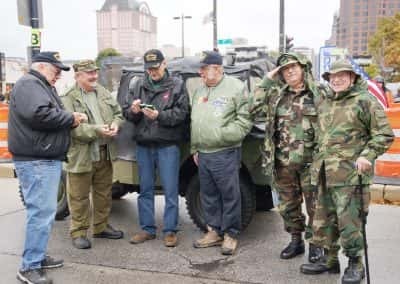 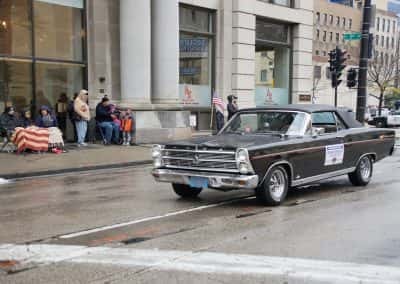 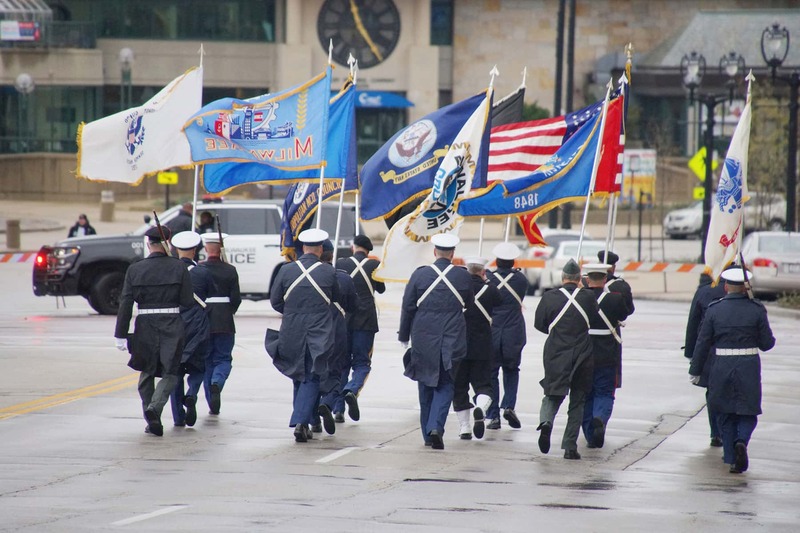 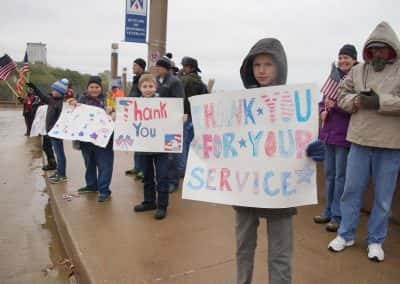 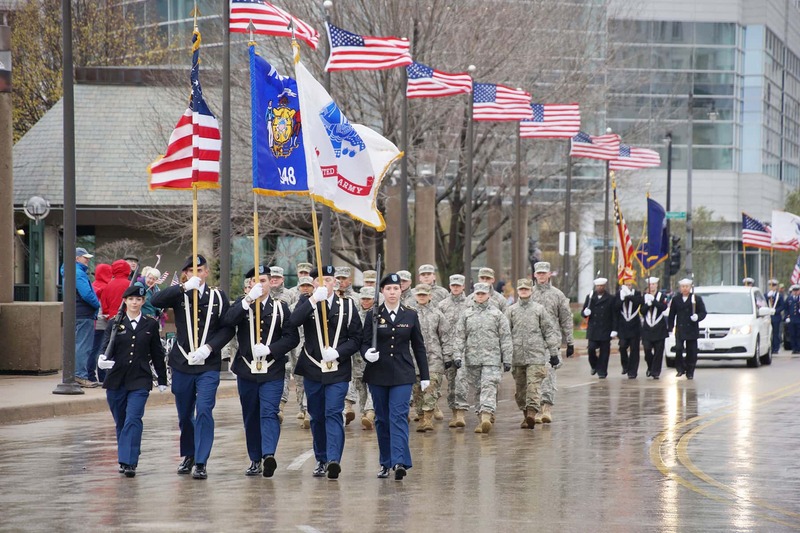 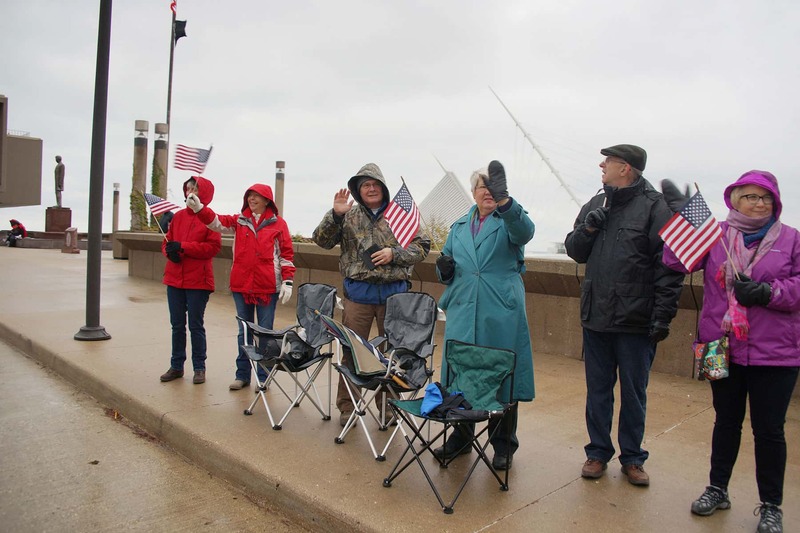 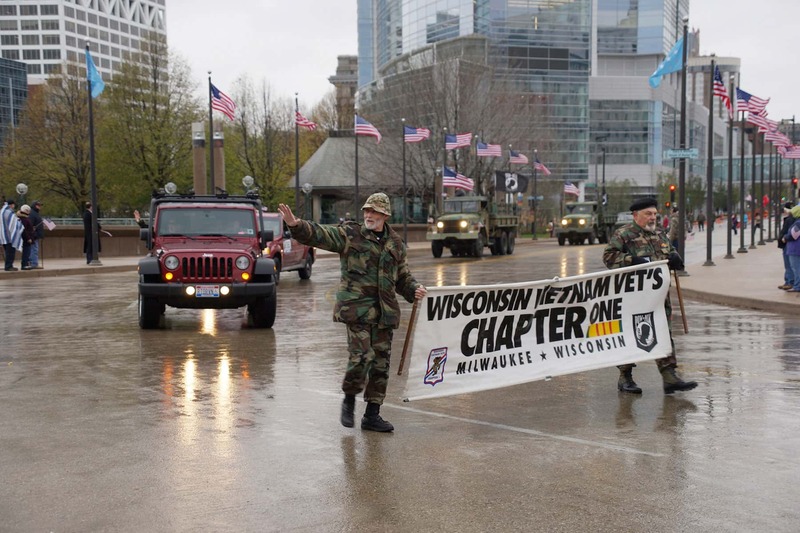 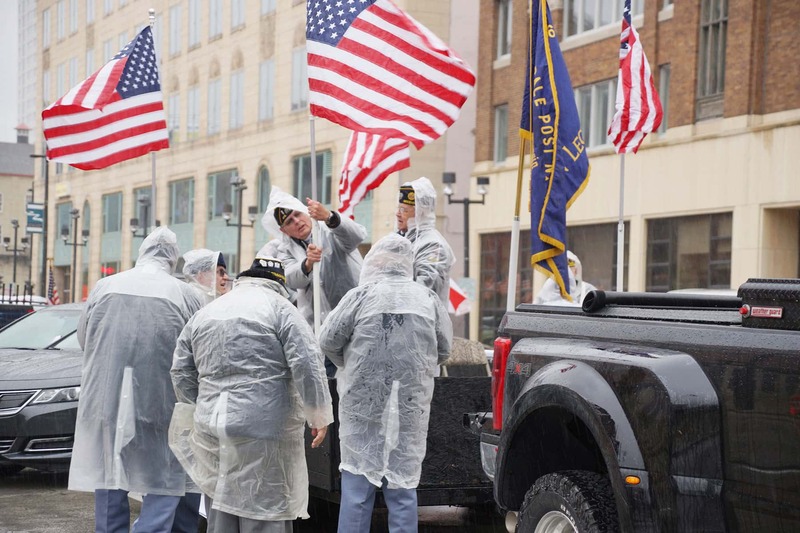 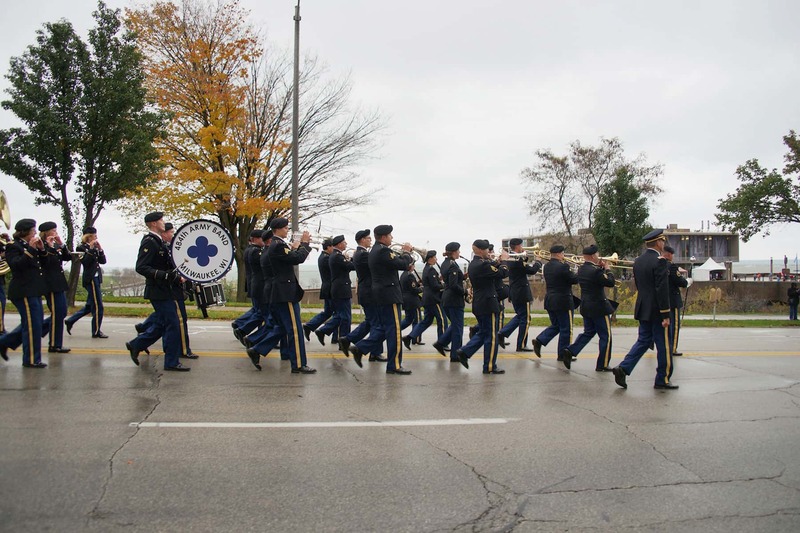 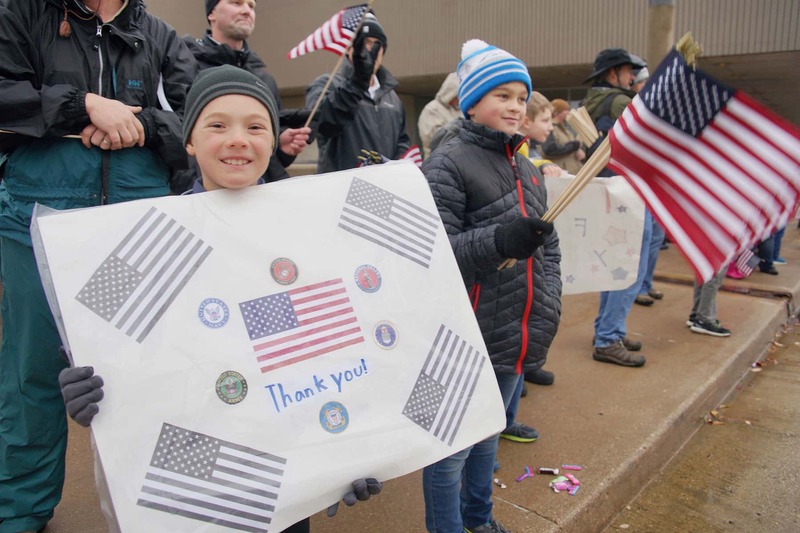 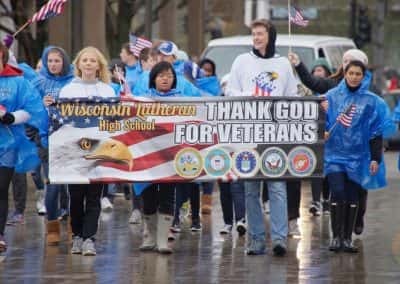 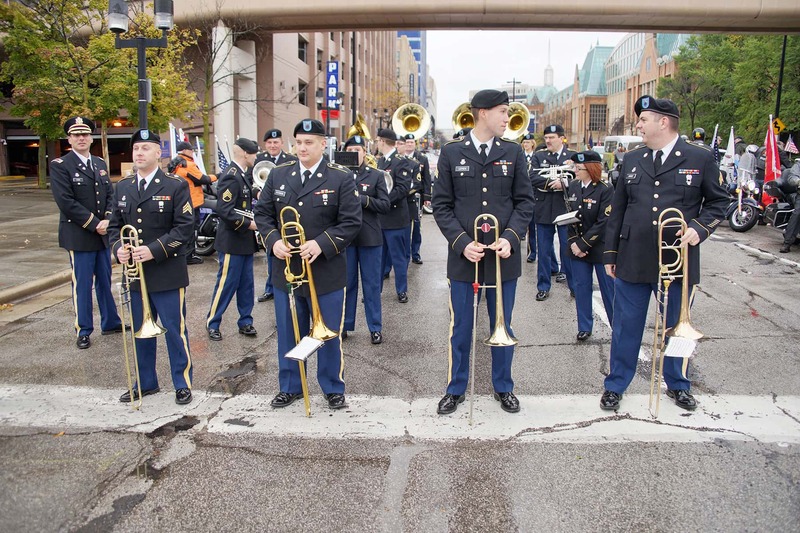 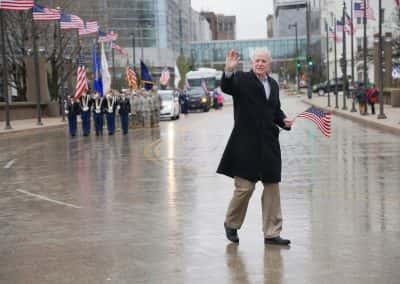 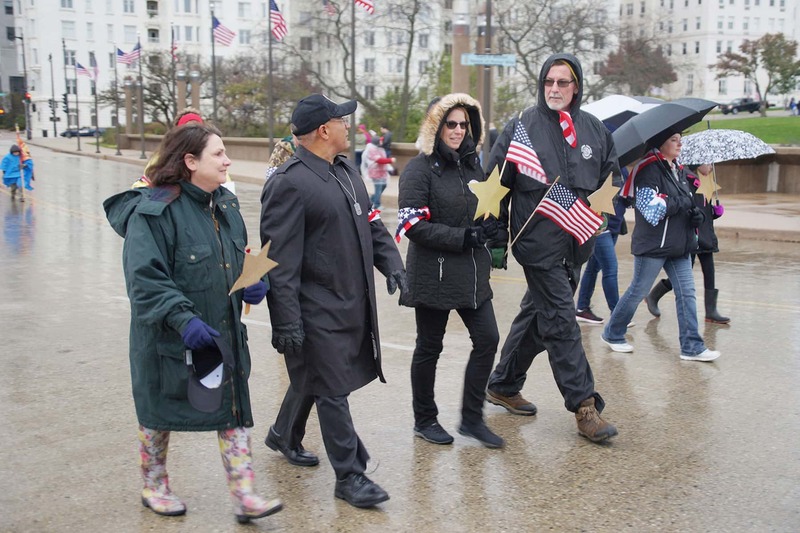 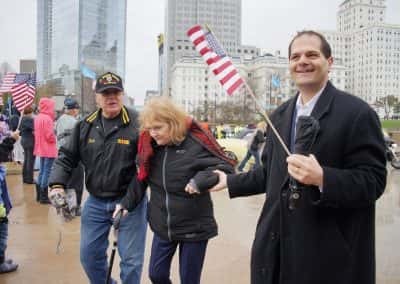 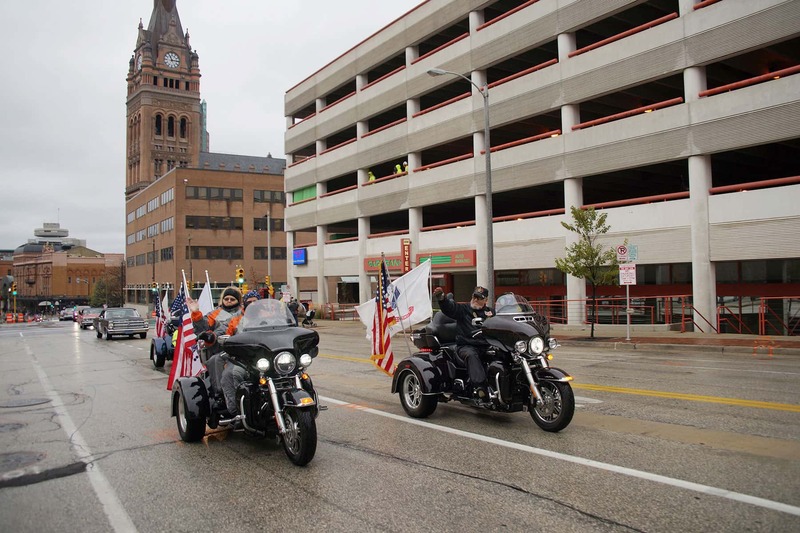 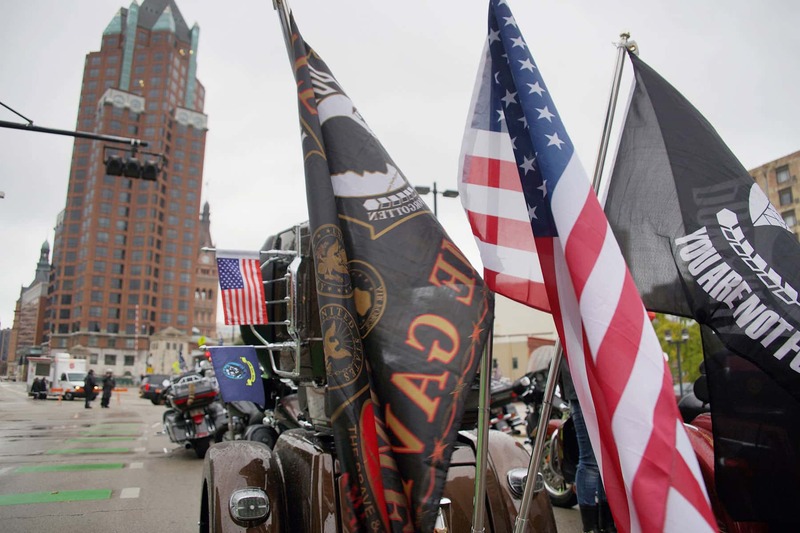 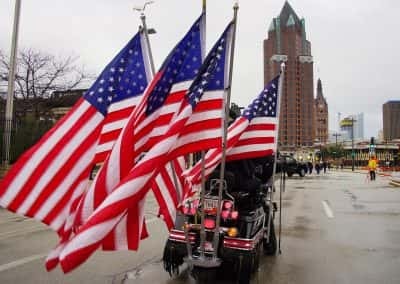 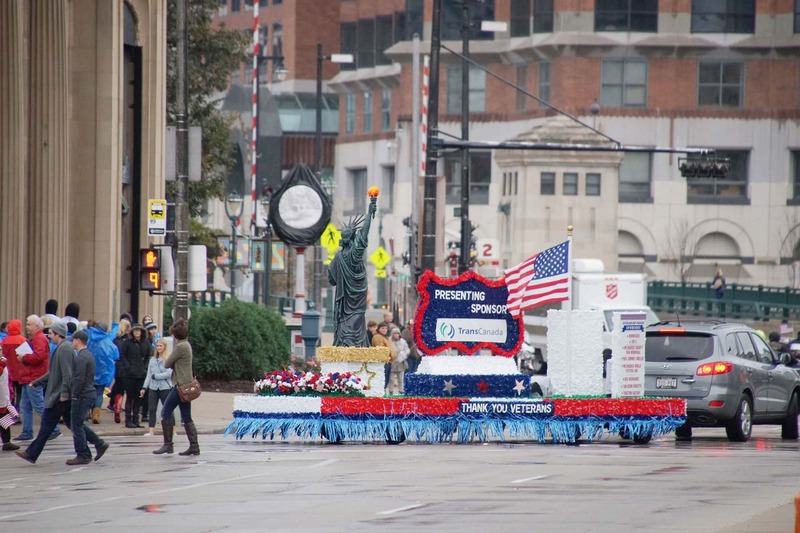 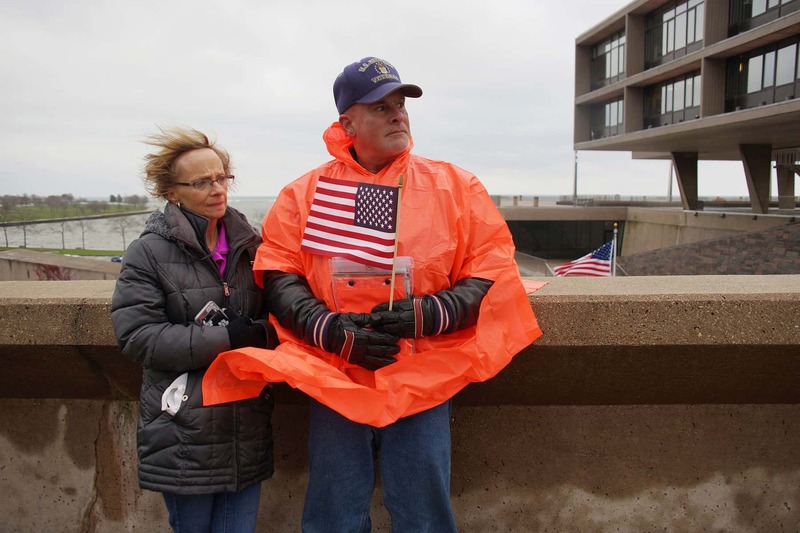 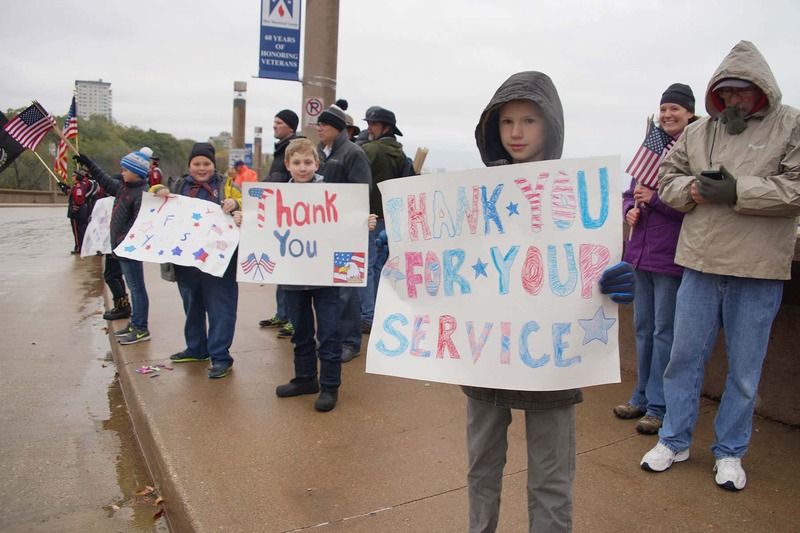 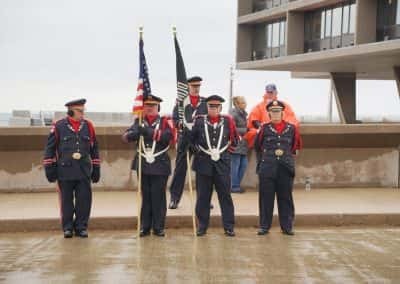 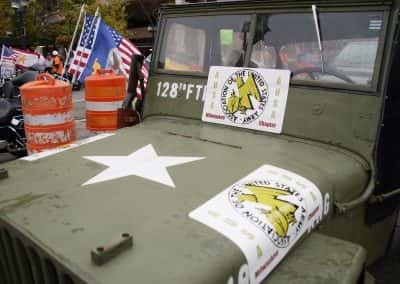 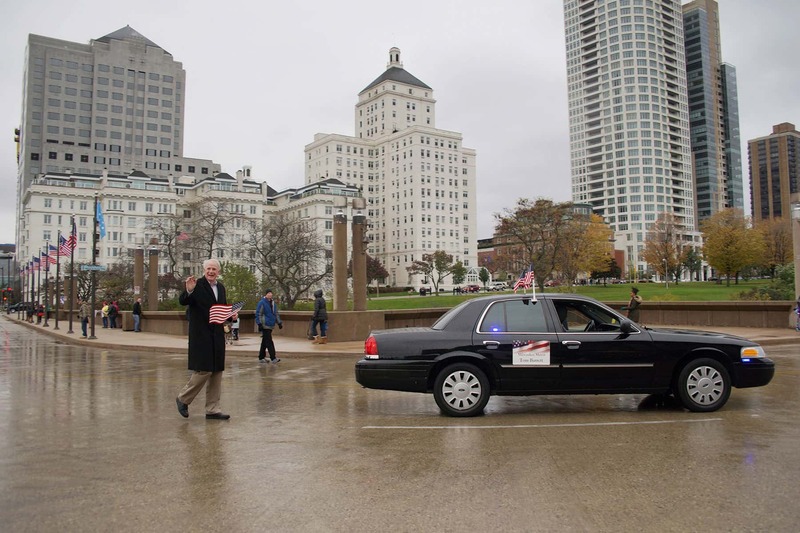 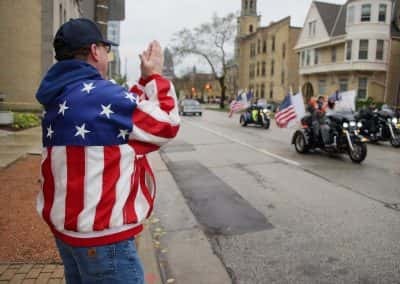 Veterans from across Southeastern Wisconsin marched through downtown Milwaukee on November 4, greeted with the cheers and gratitude from the public, for an event that honored their service to the nation. 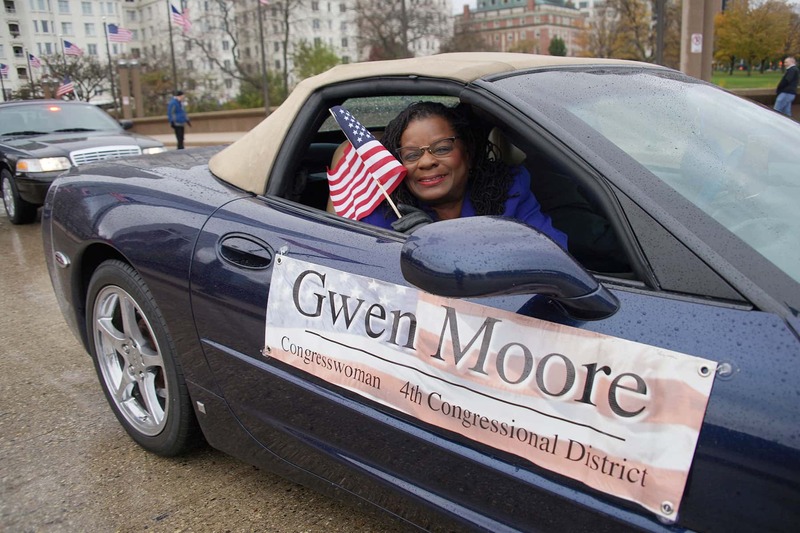 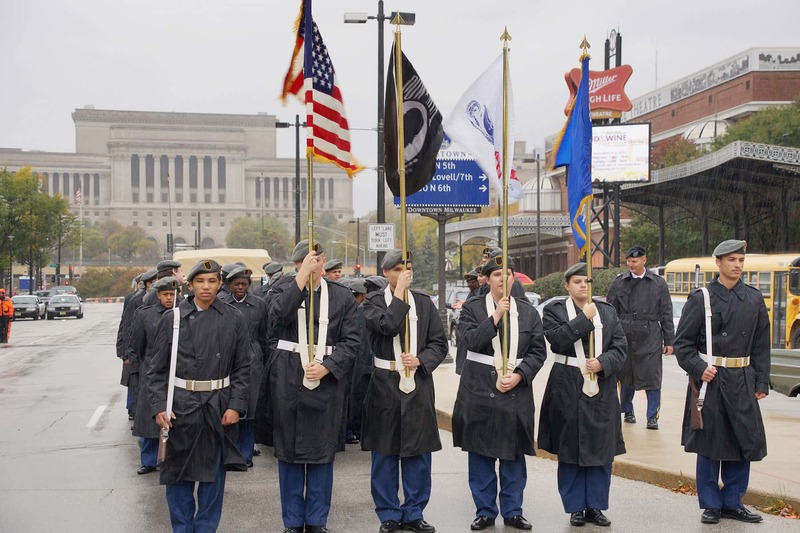 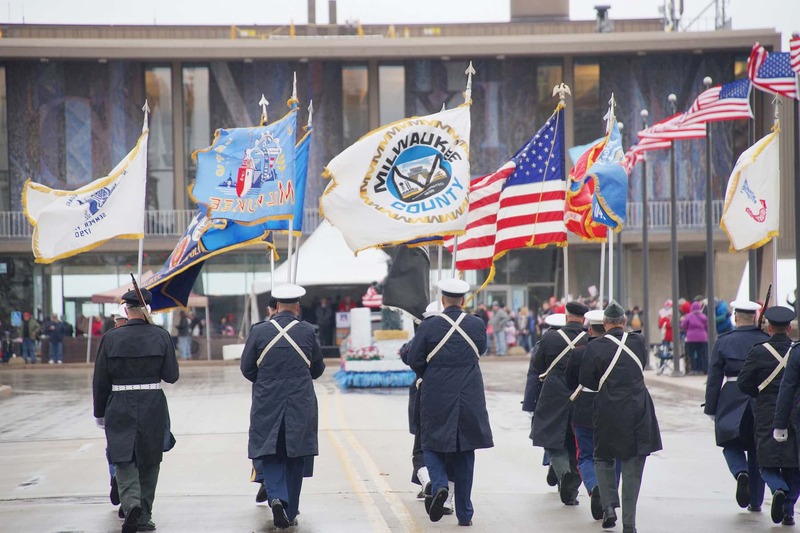 The first celebration using the term Veterans Day occurred in Birmingham, Alabama, in 1947. 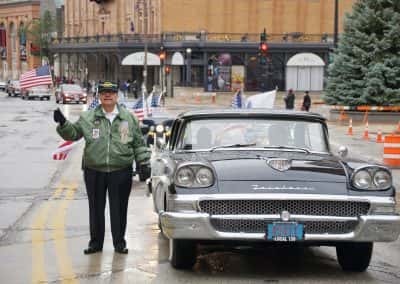 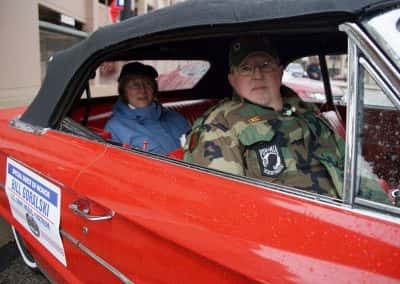 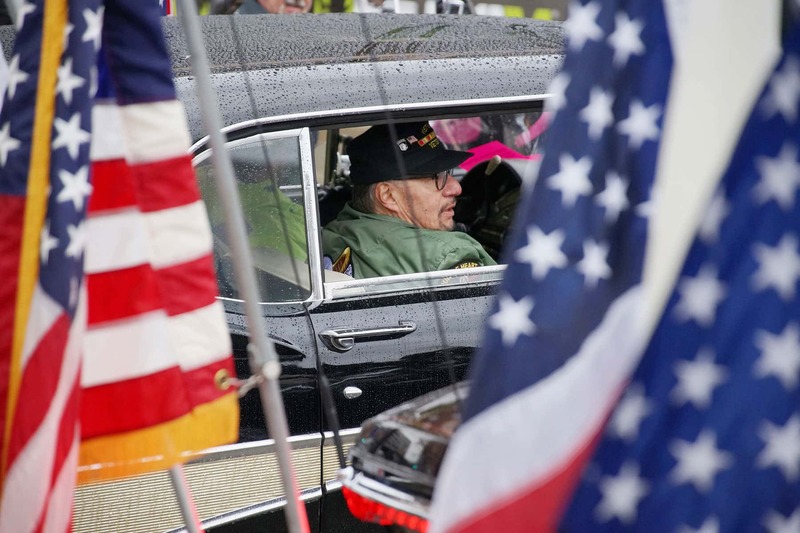 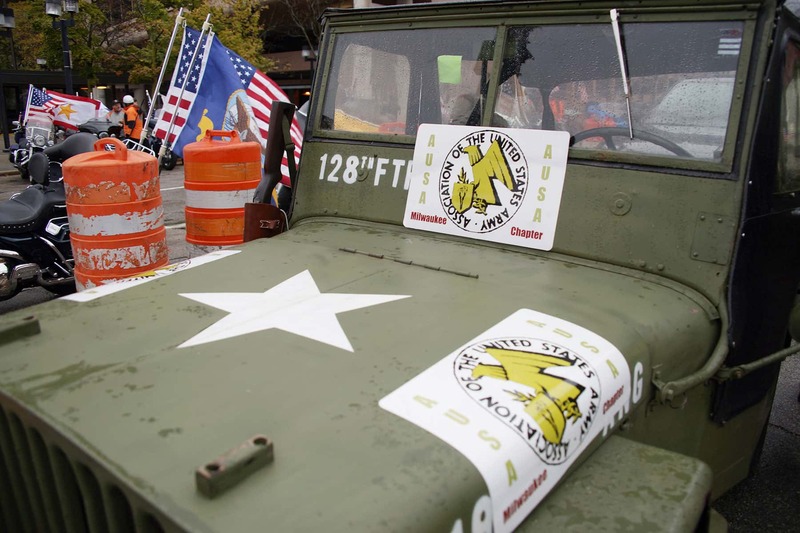 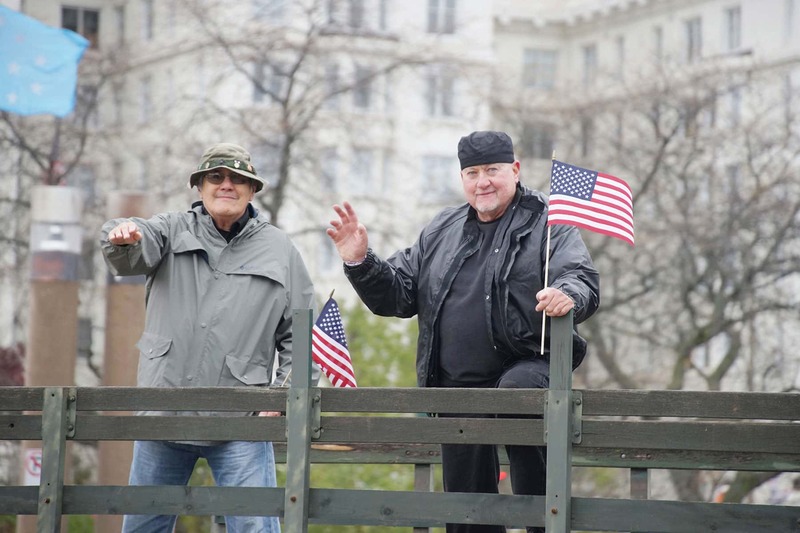 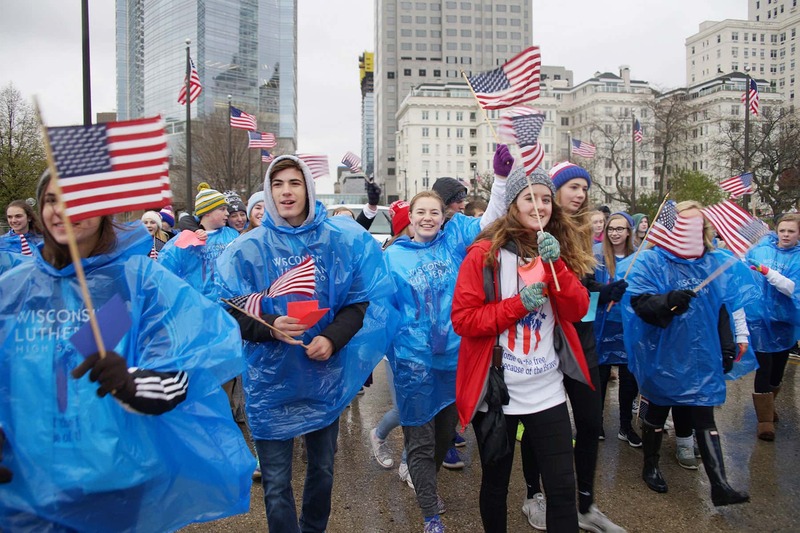 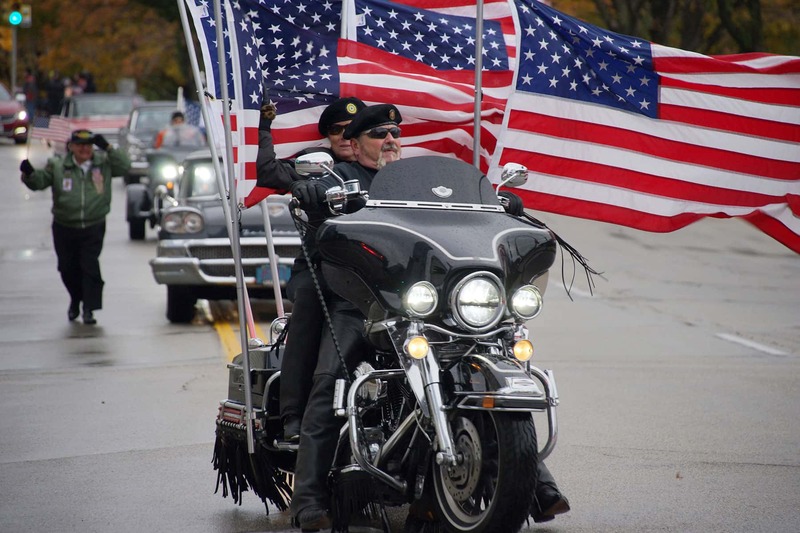 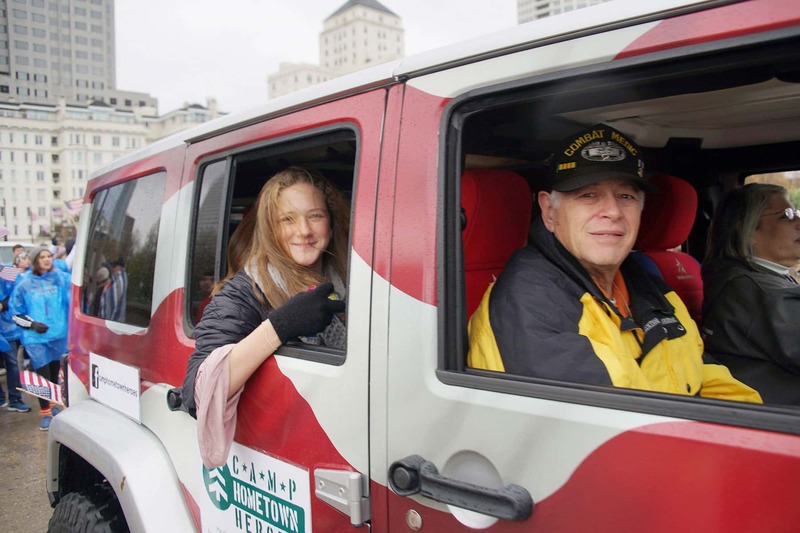 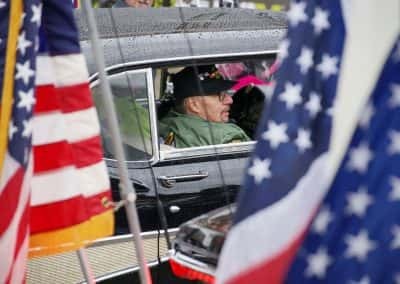 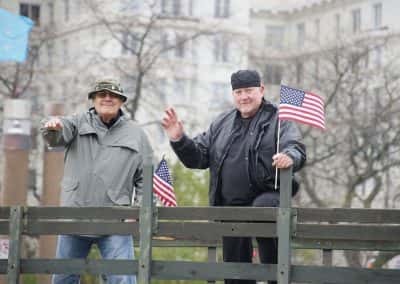 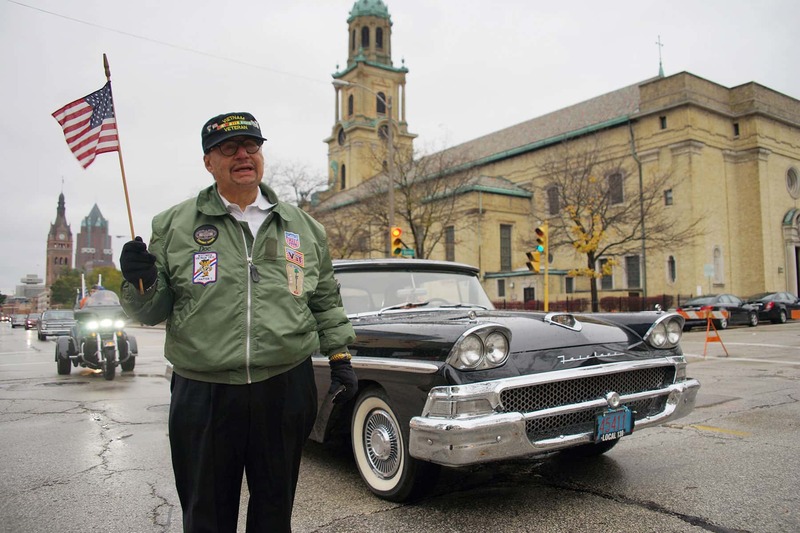 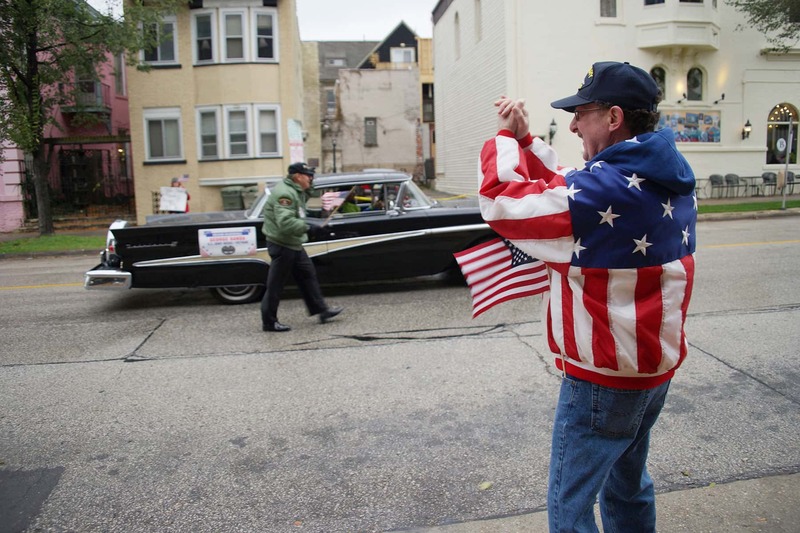 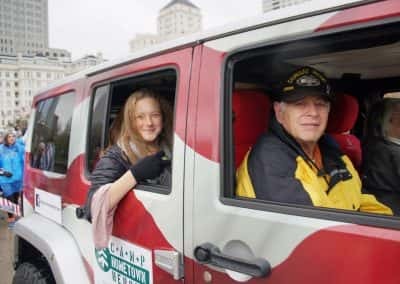 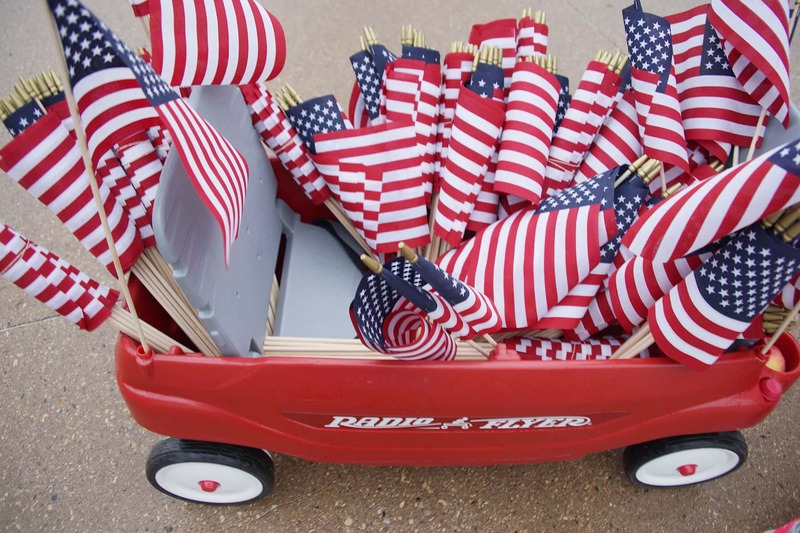 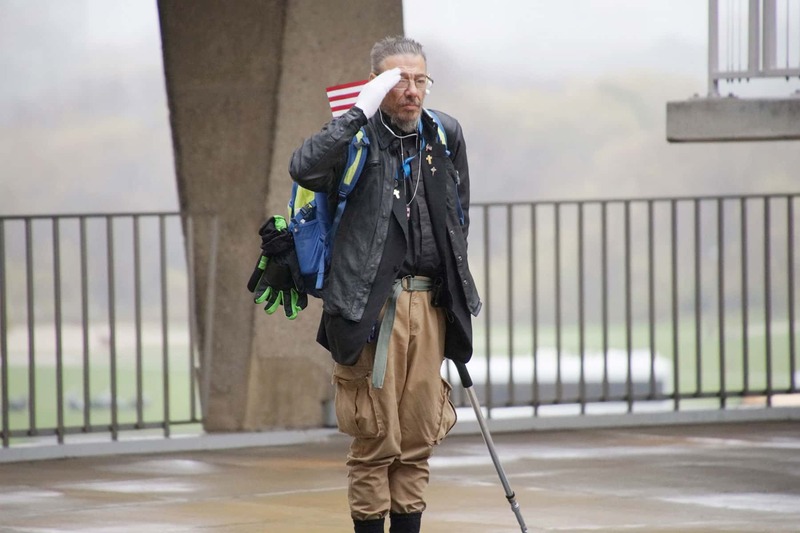 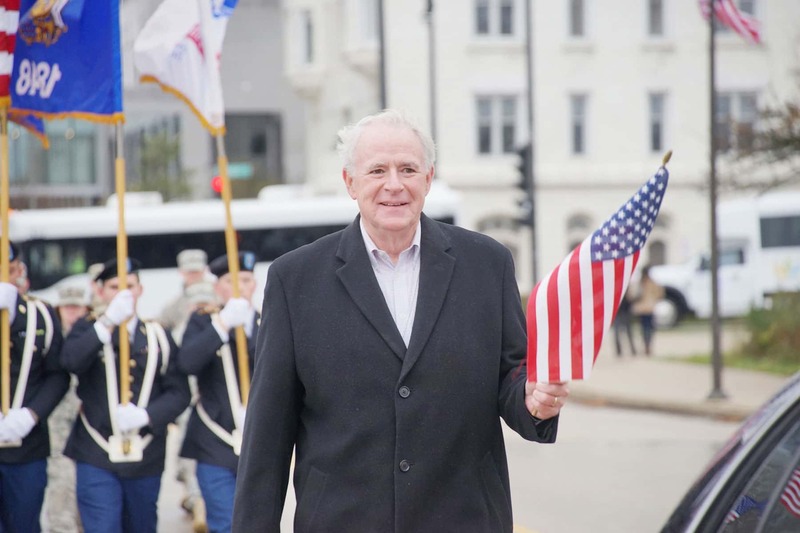 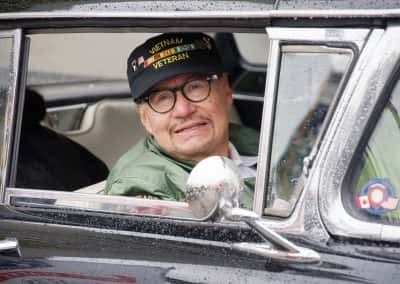 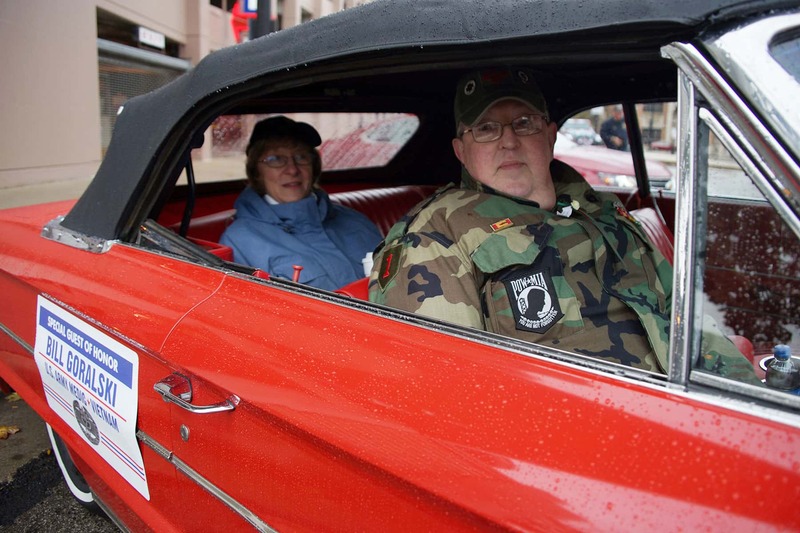 Raymond Weeks, a World War II veteran, organized “National Veterans Day,” which included a parade and other festivities, to honor all veterans. 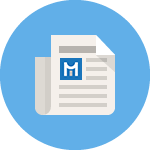 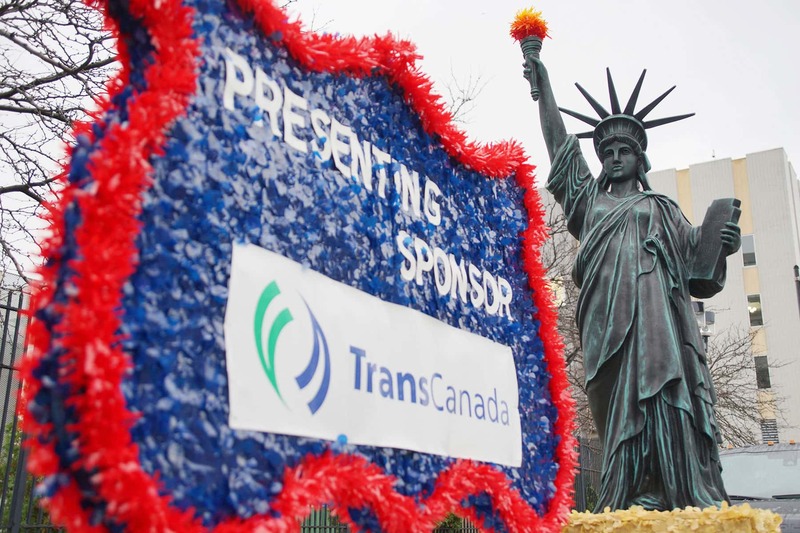 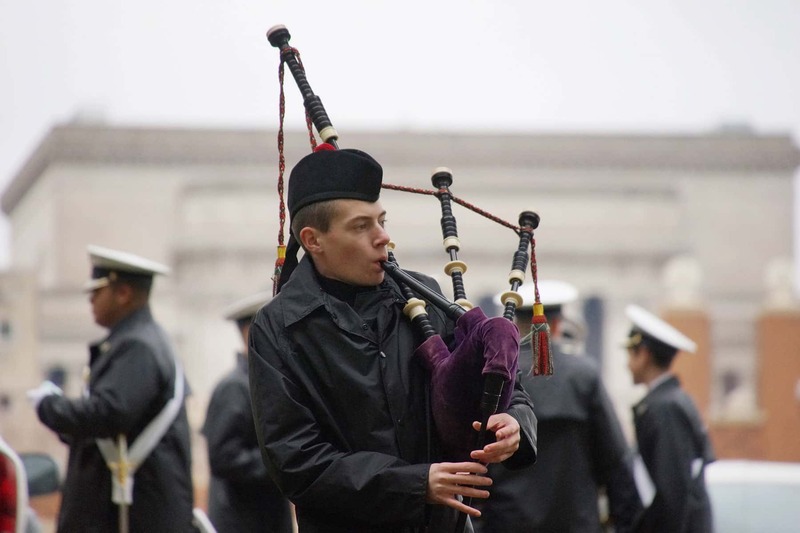 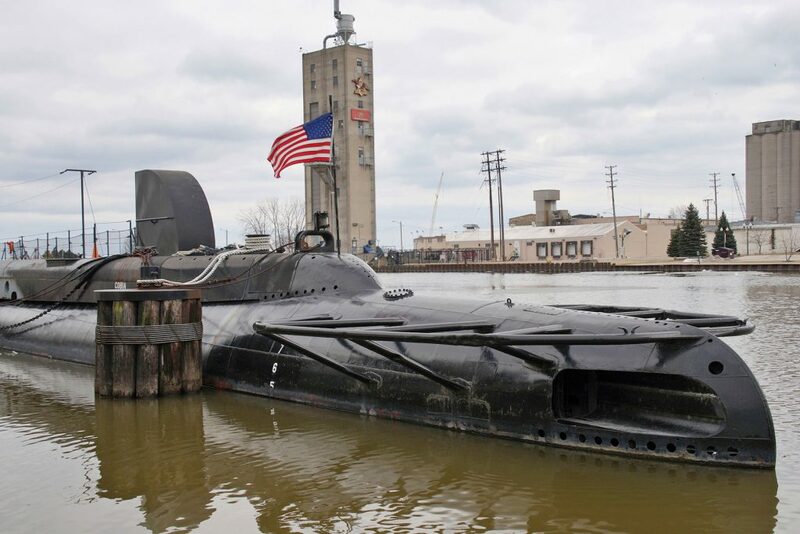 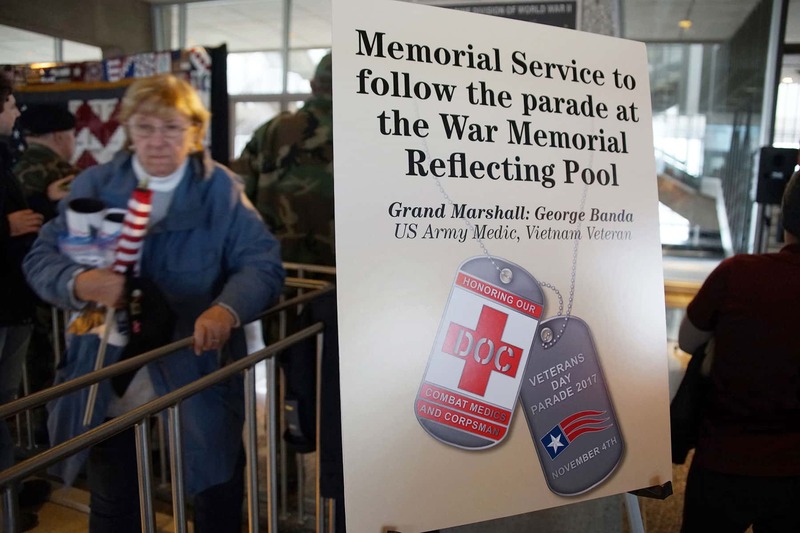 The event was held on November 11, then designated Armistice Day. 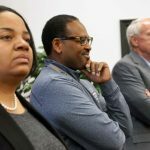 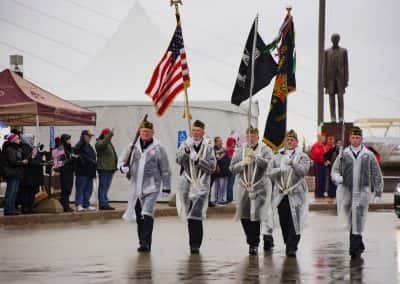 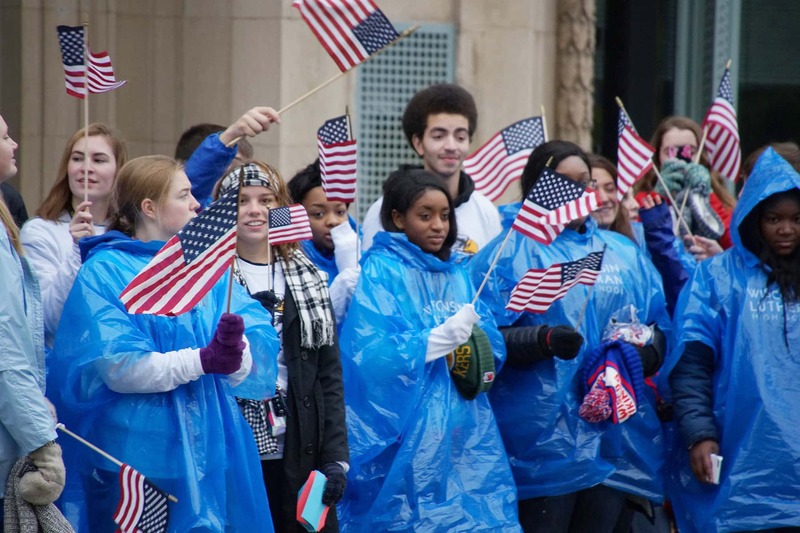 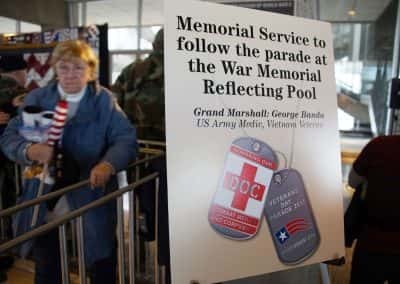 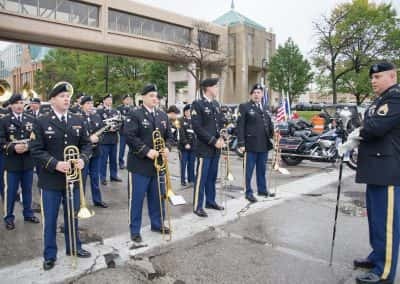 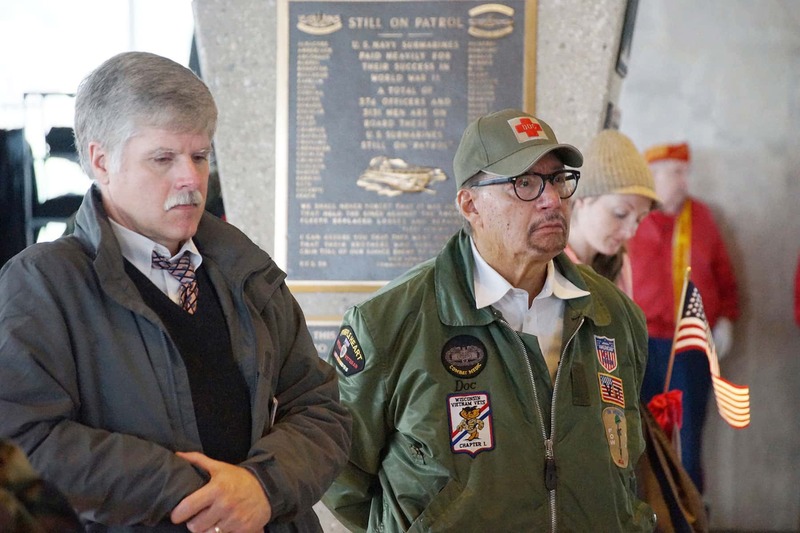 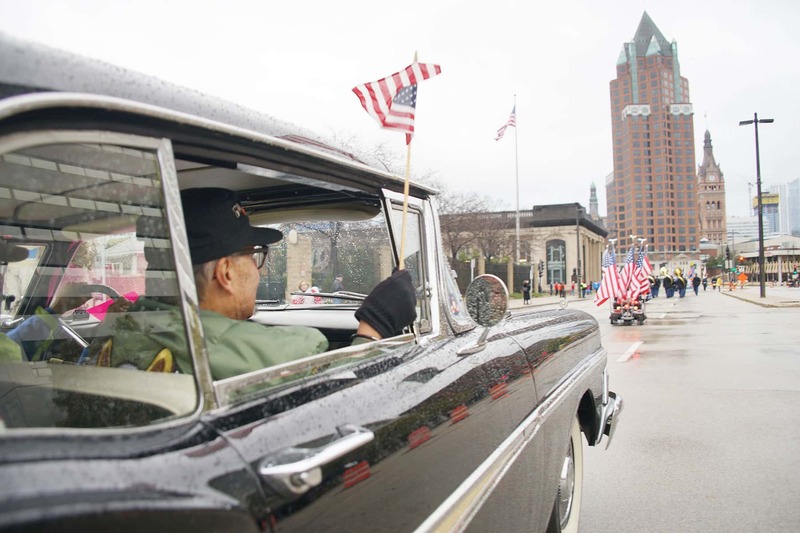 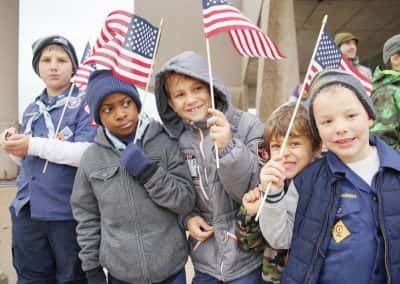 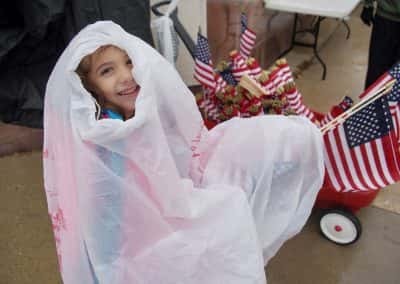 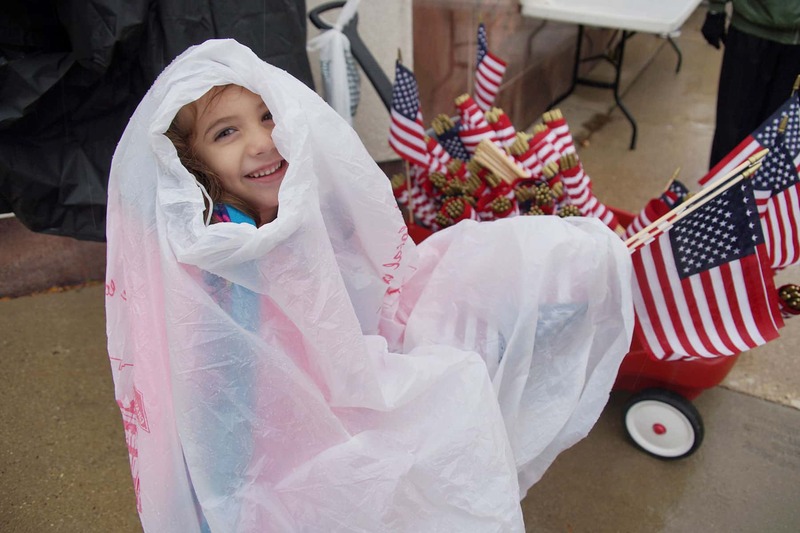 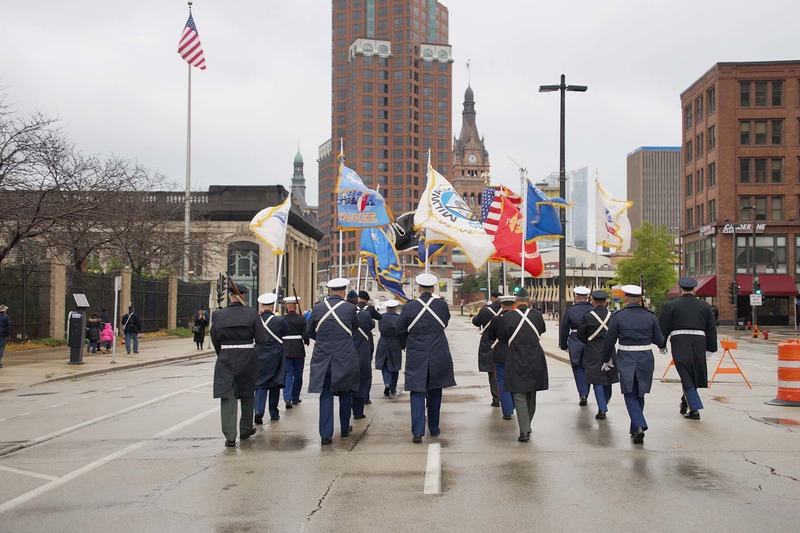 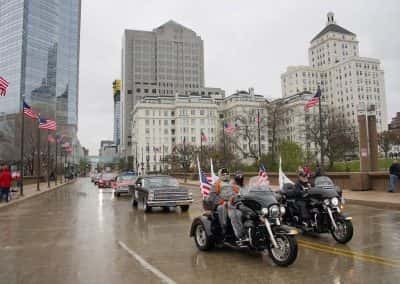 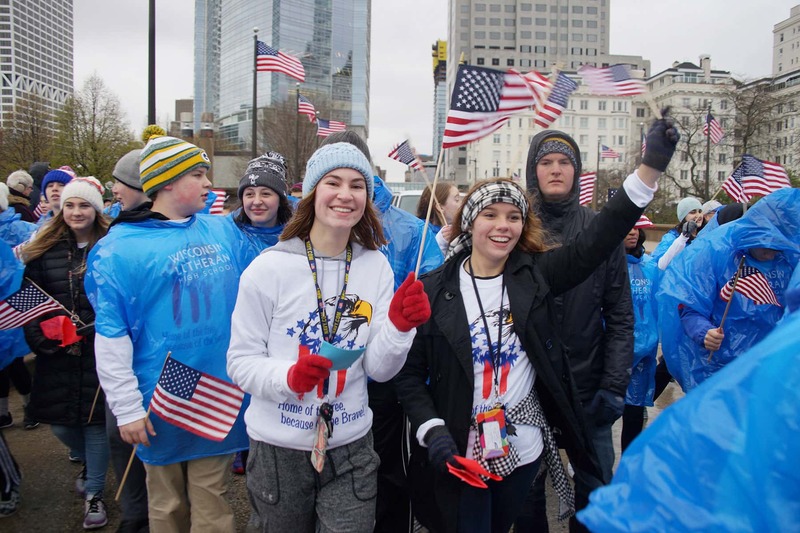 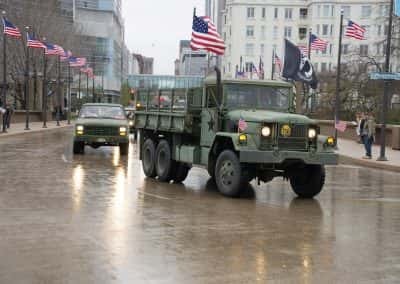 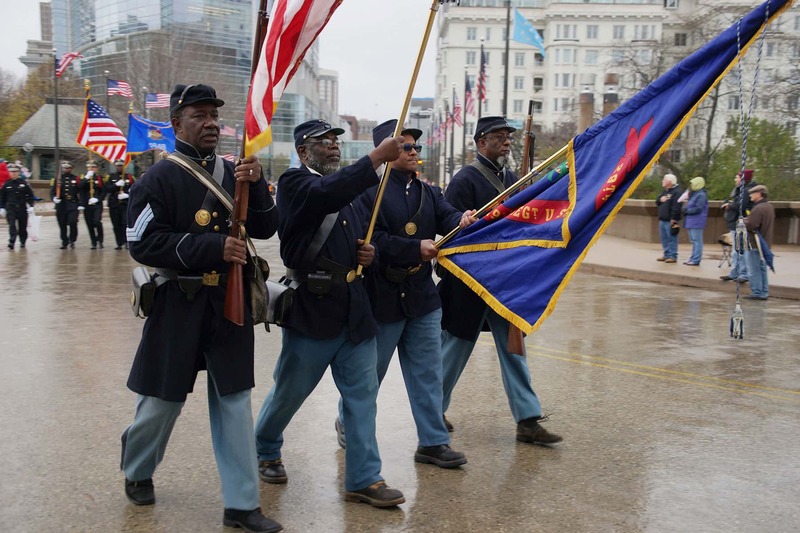 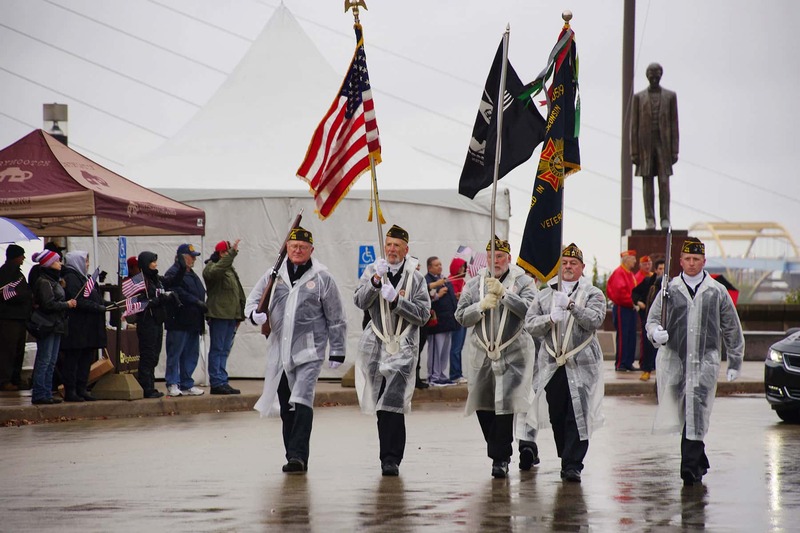 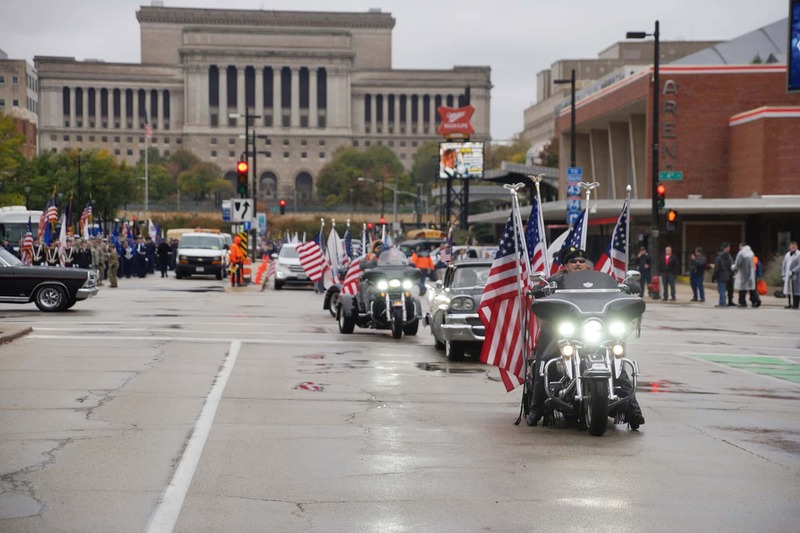 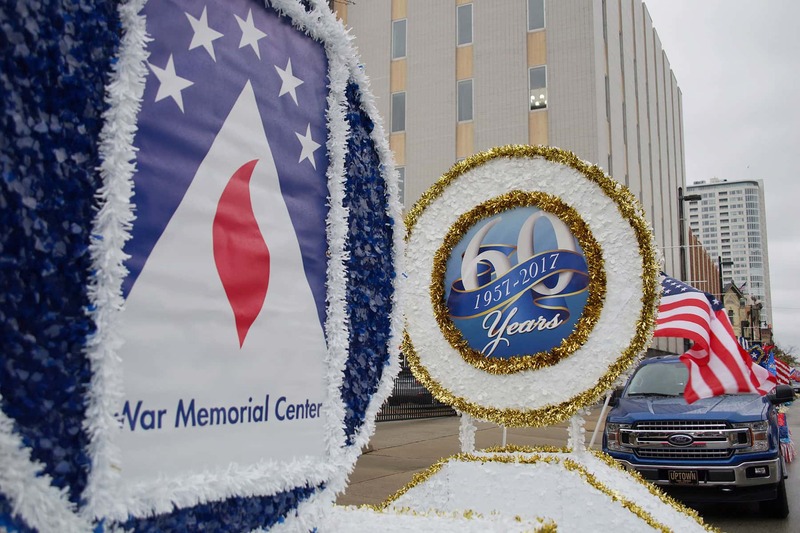 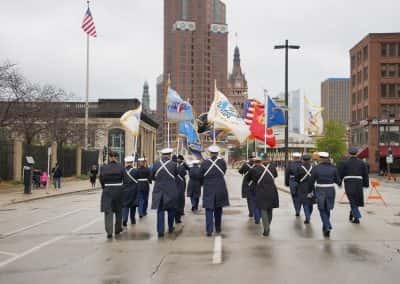 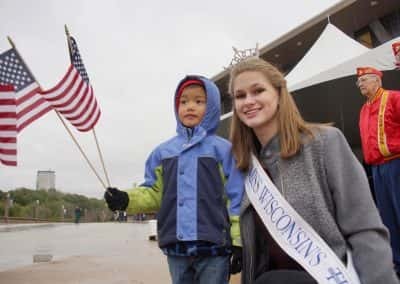 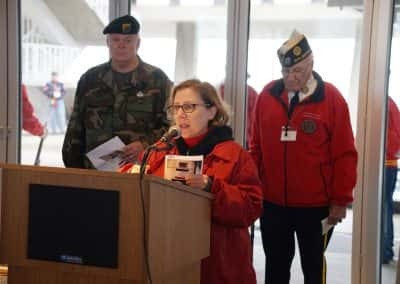 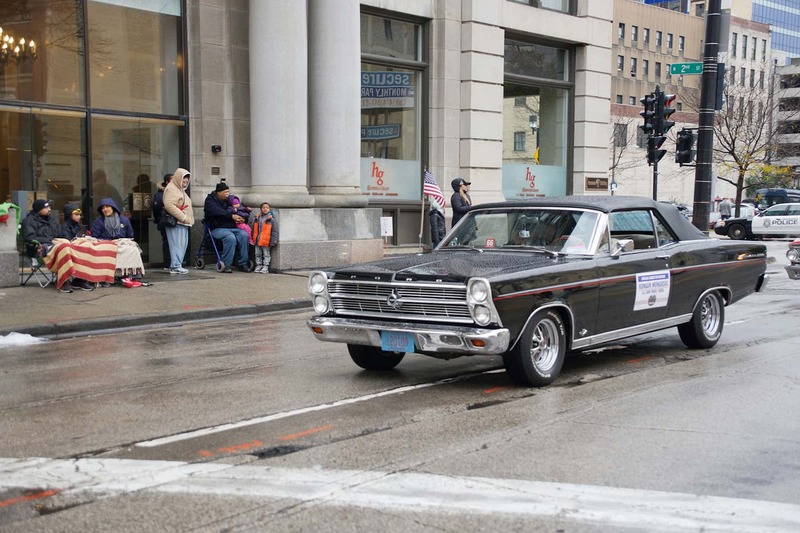 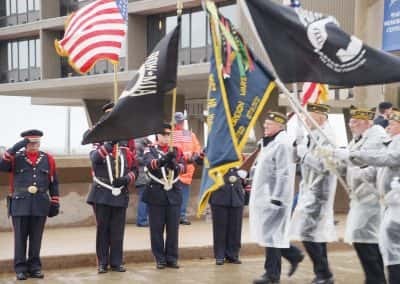 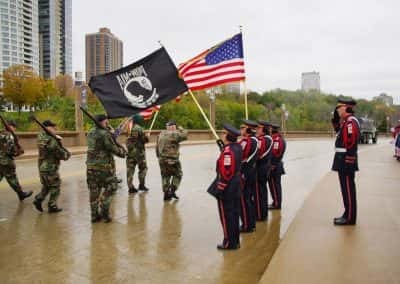 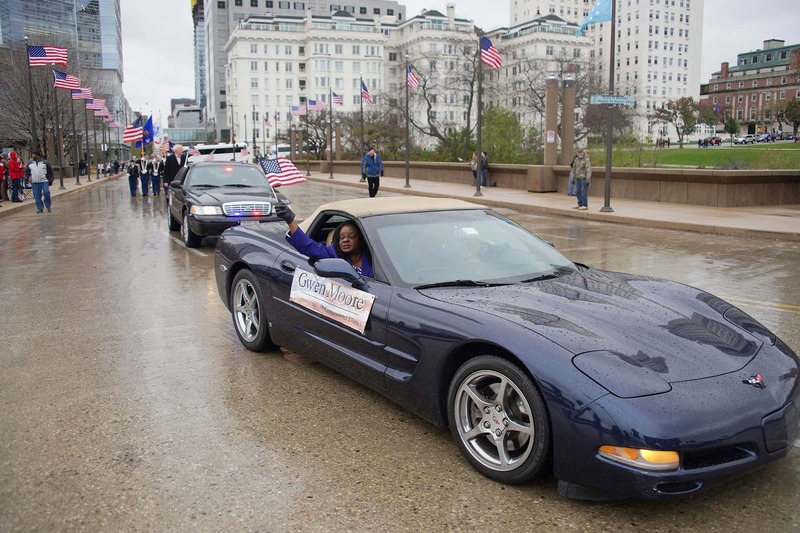 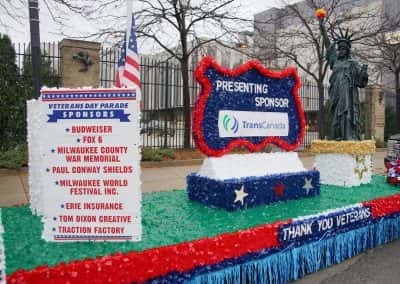 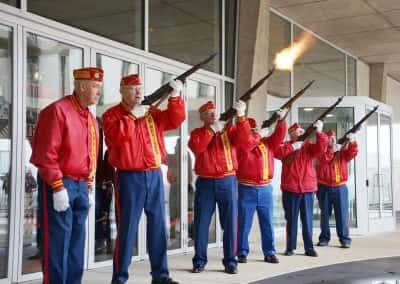 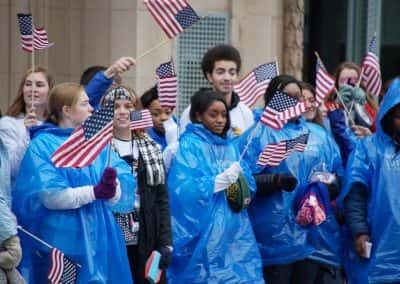 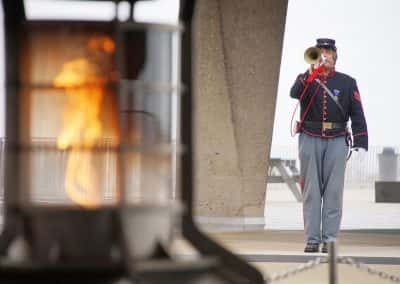 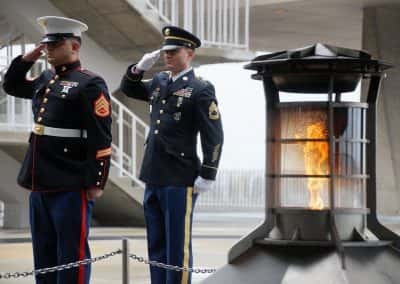 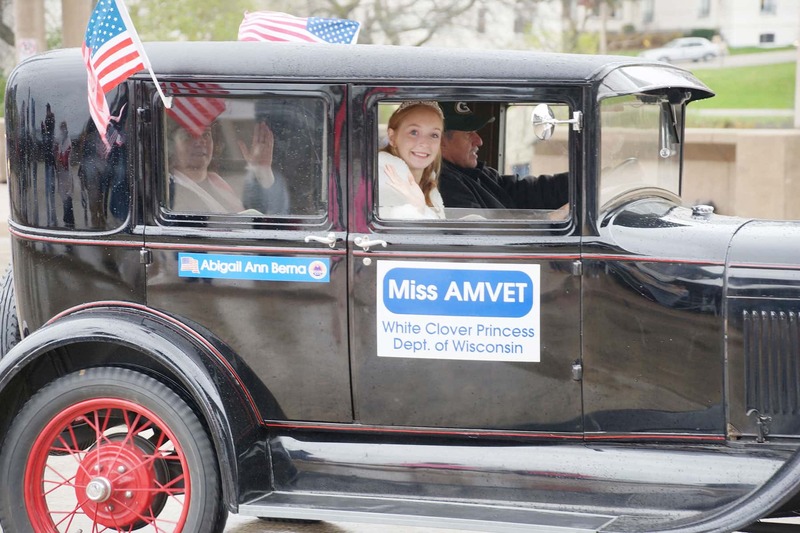 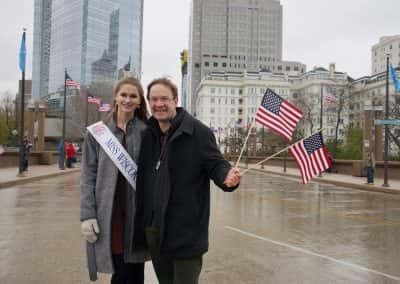 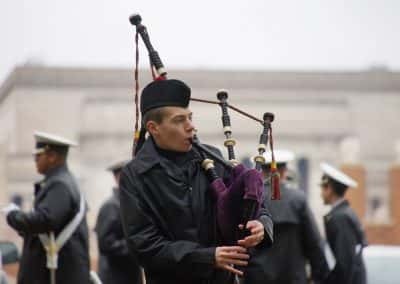 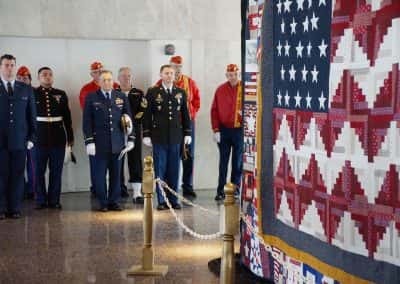 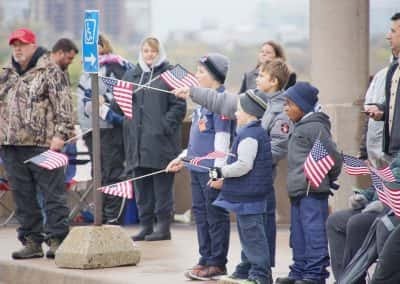 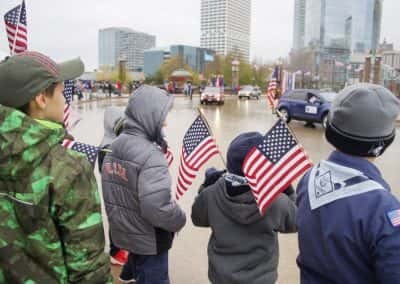 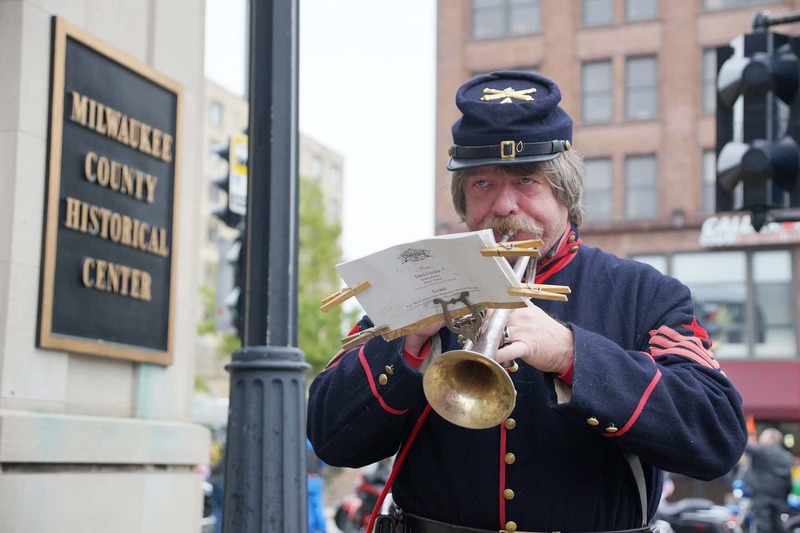 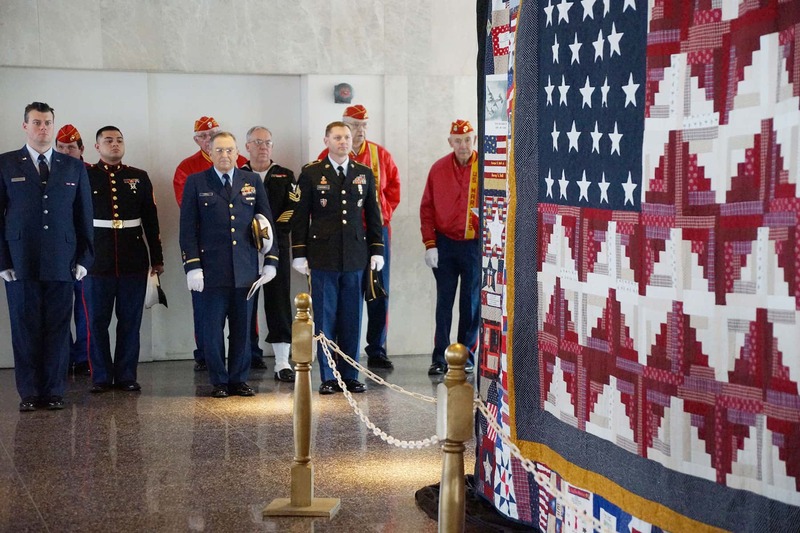 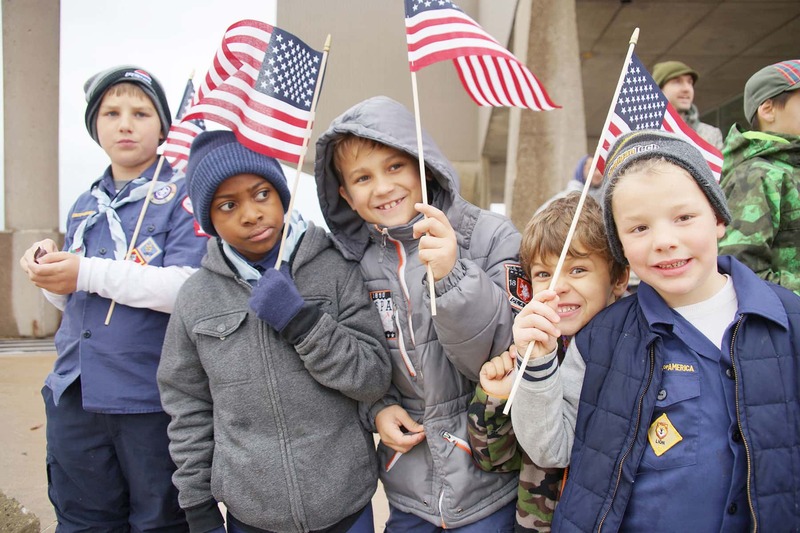 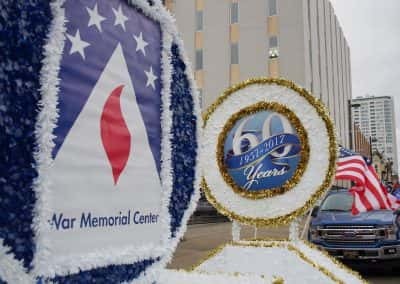 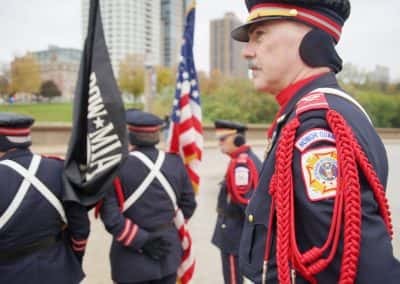 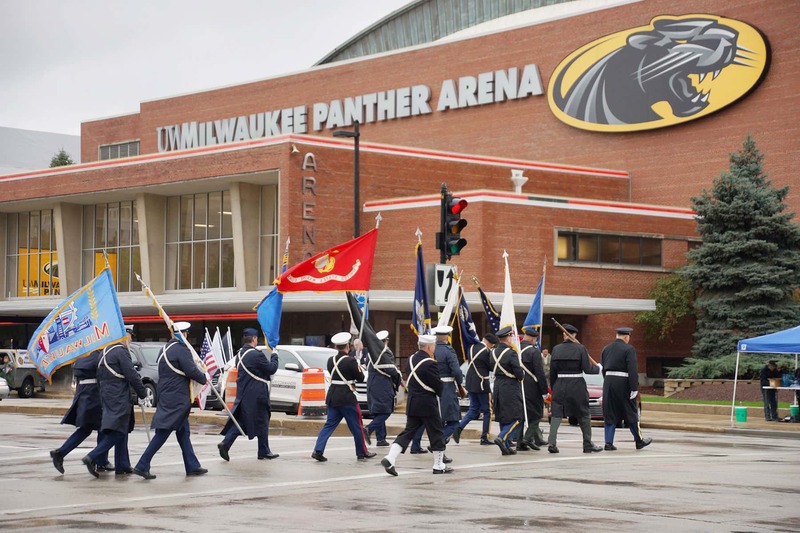 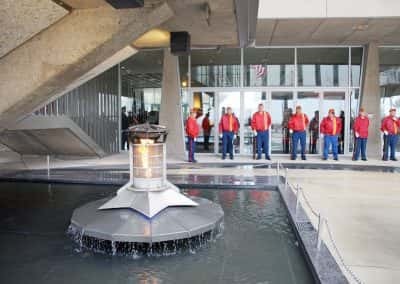 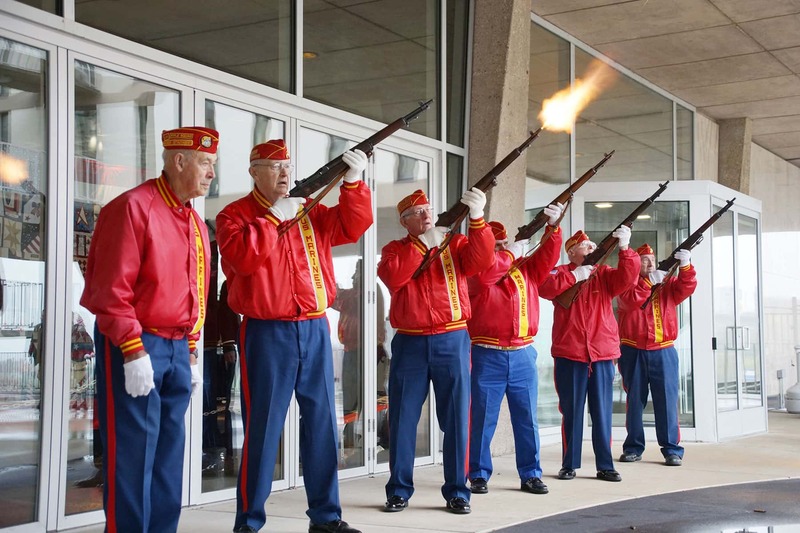 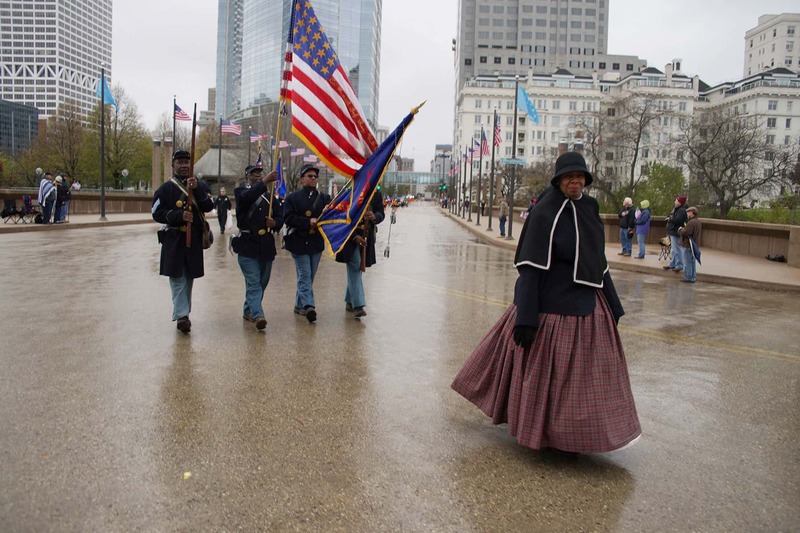 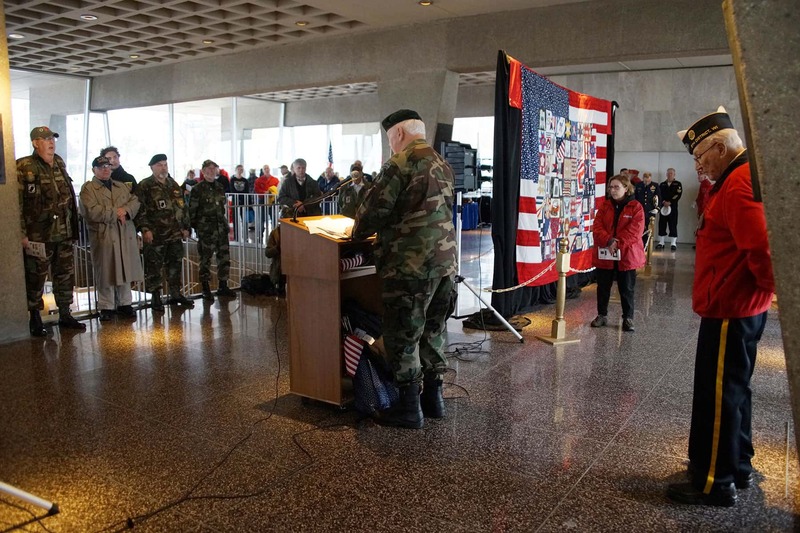 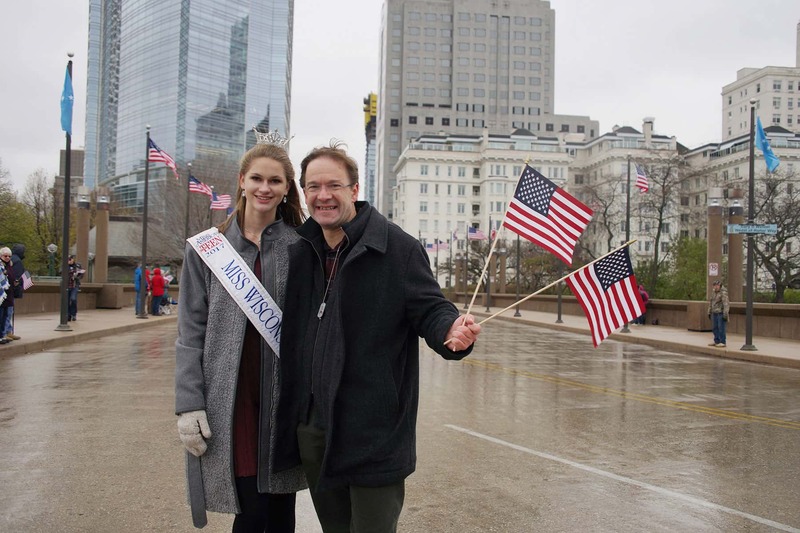 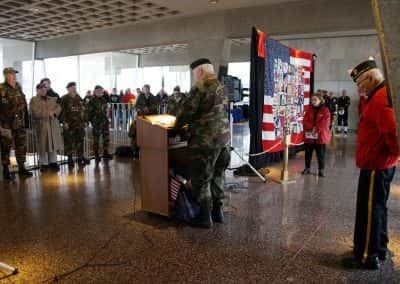 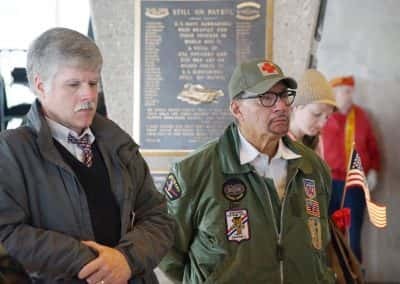 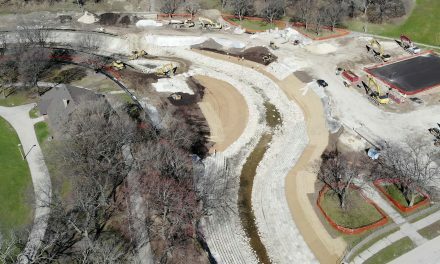 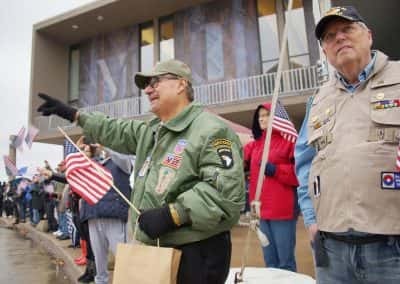 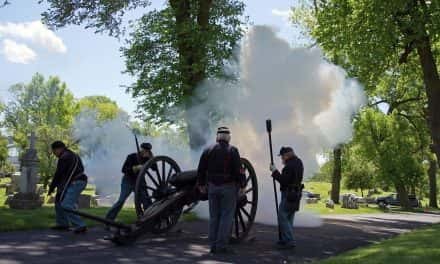 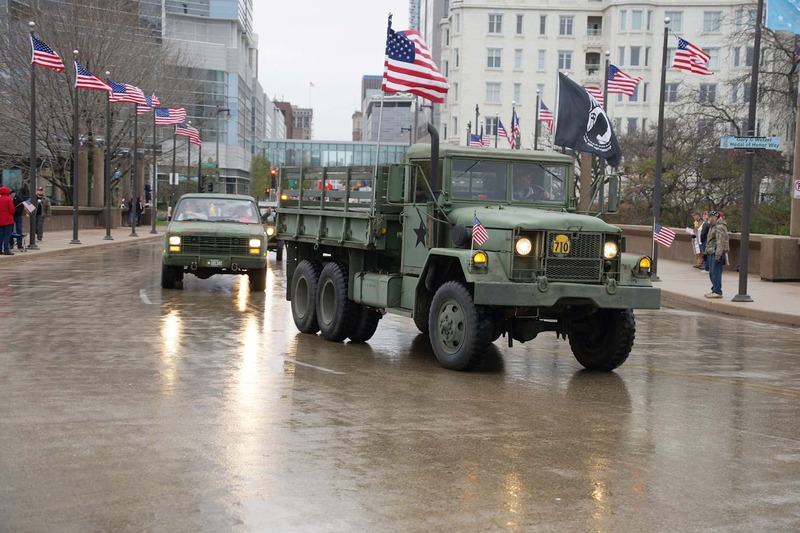 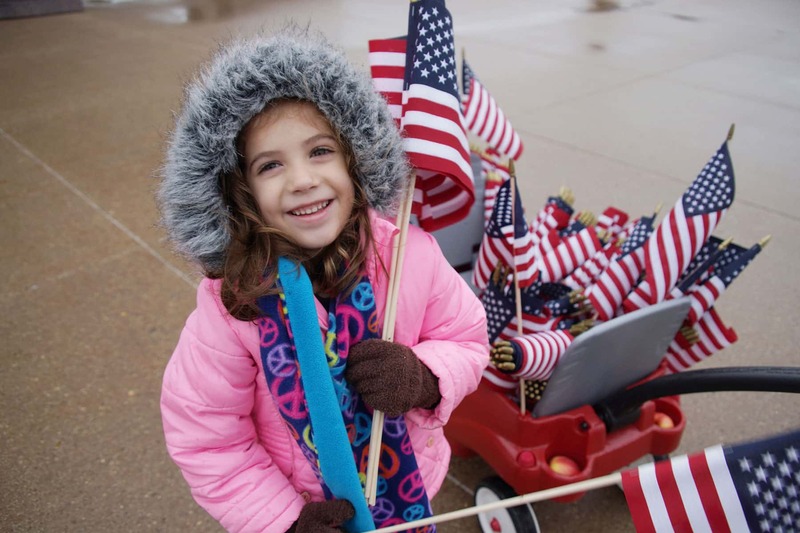 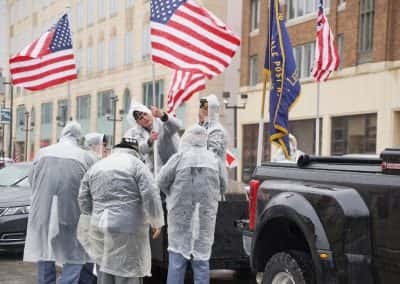 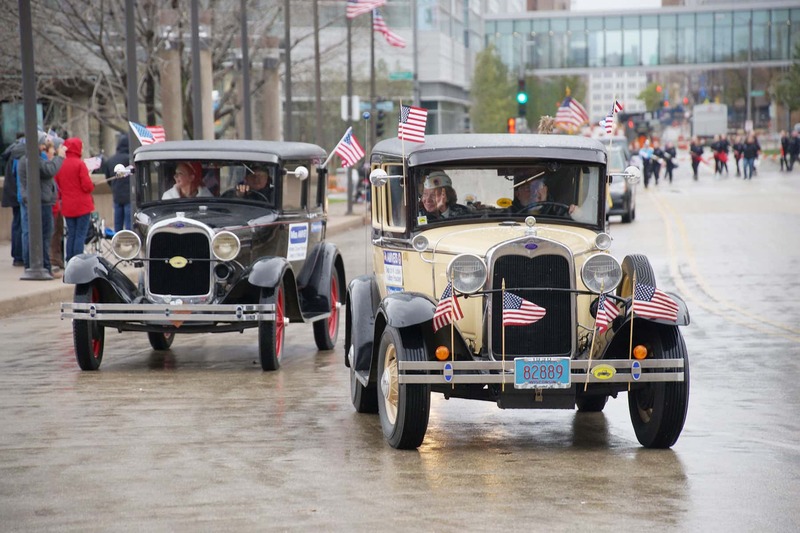 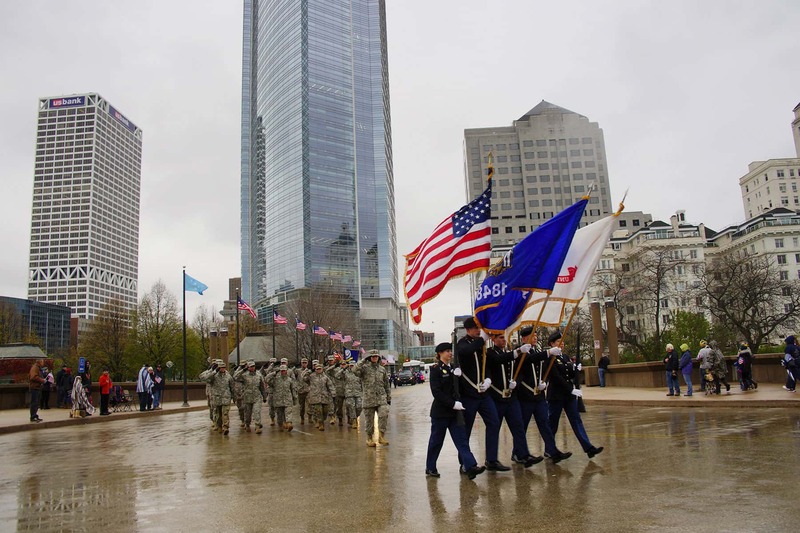 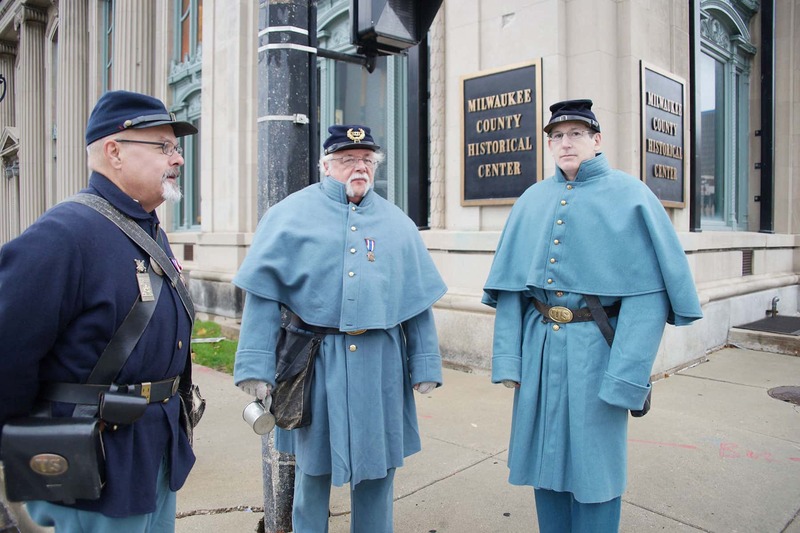 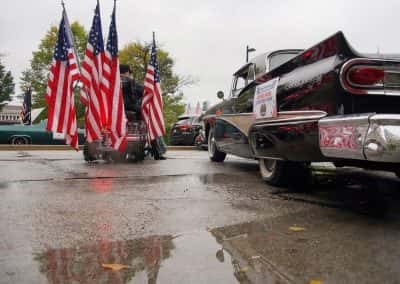 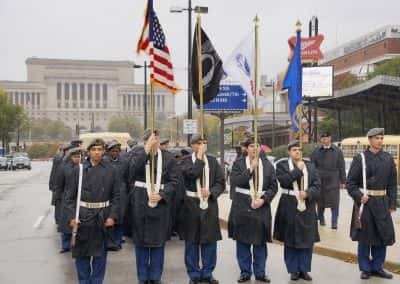 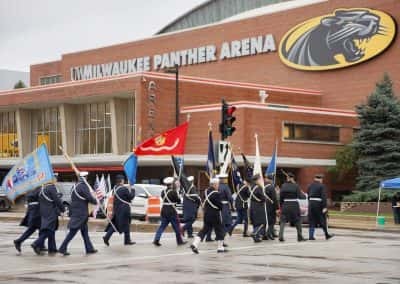 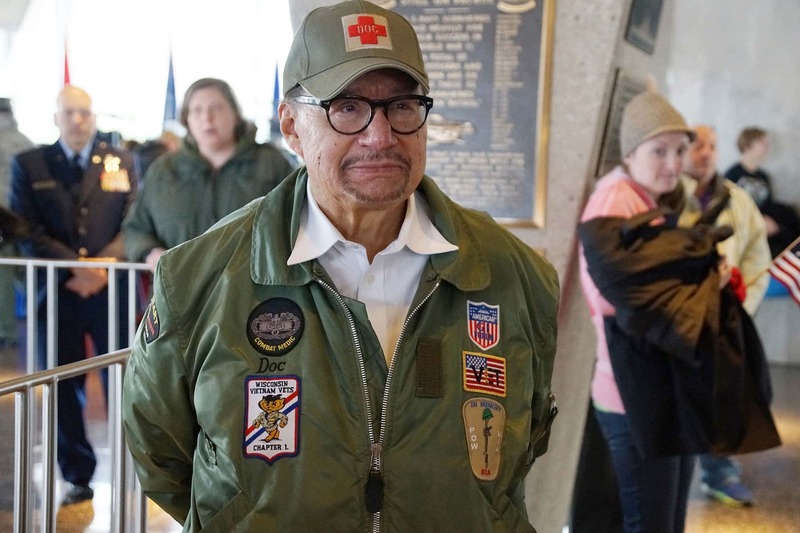 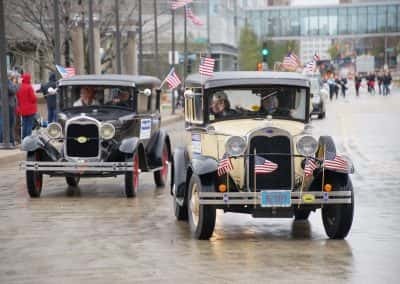 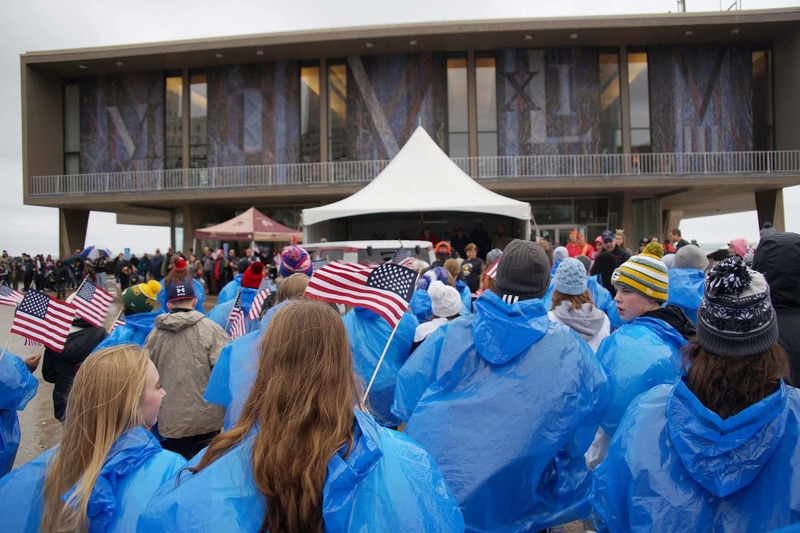 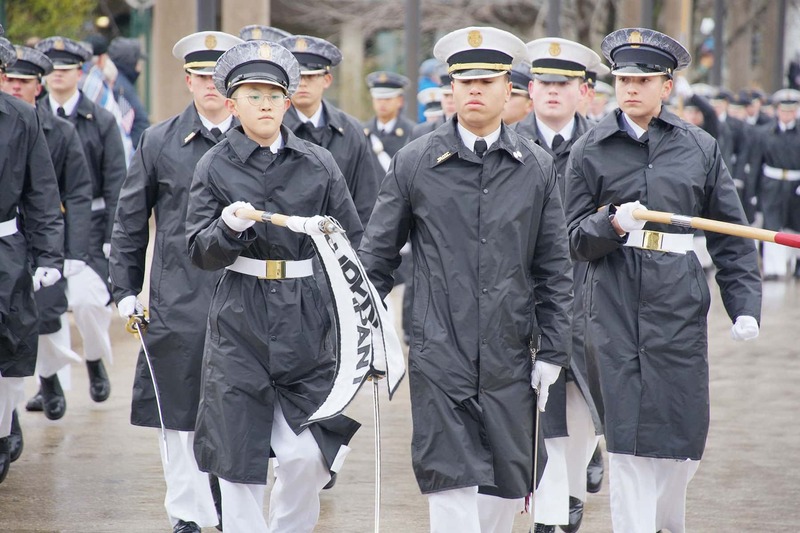 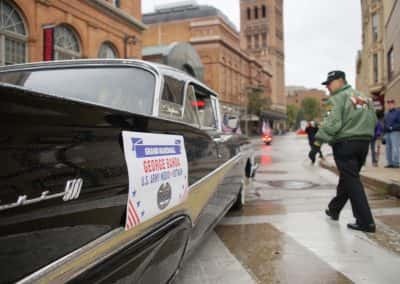 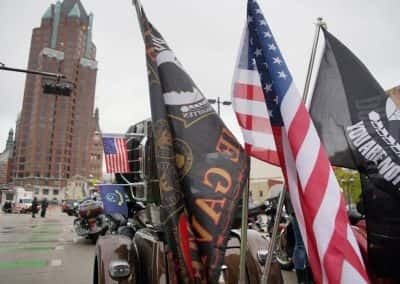 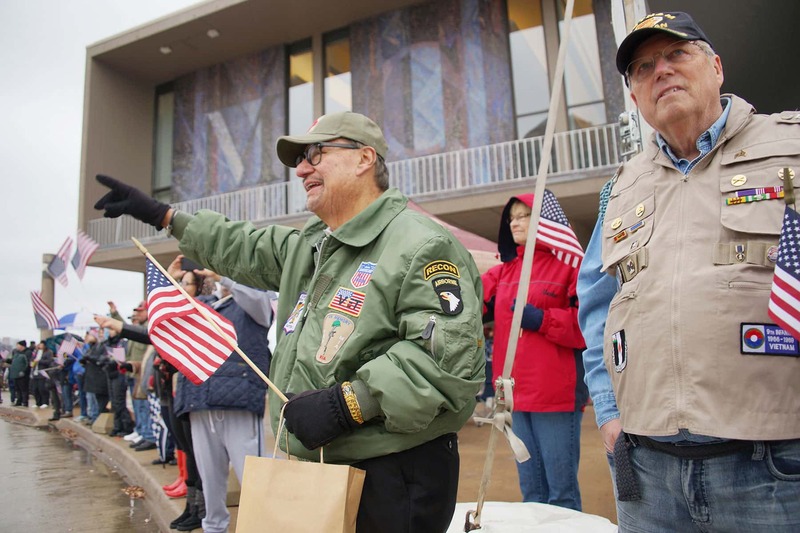 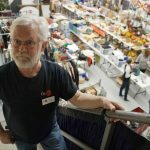 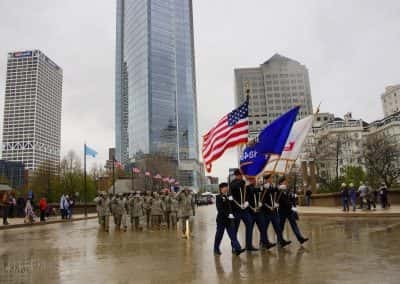 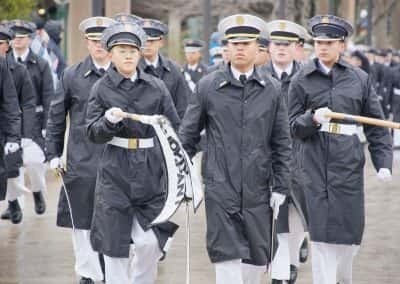 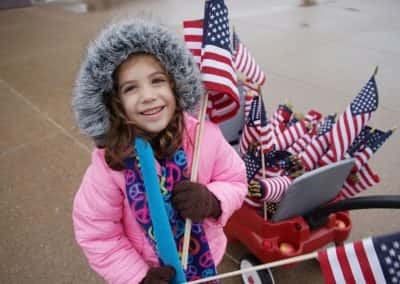 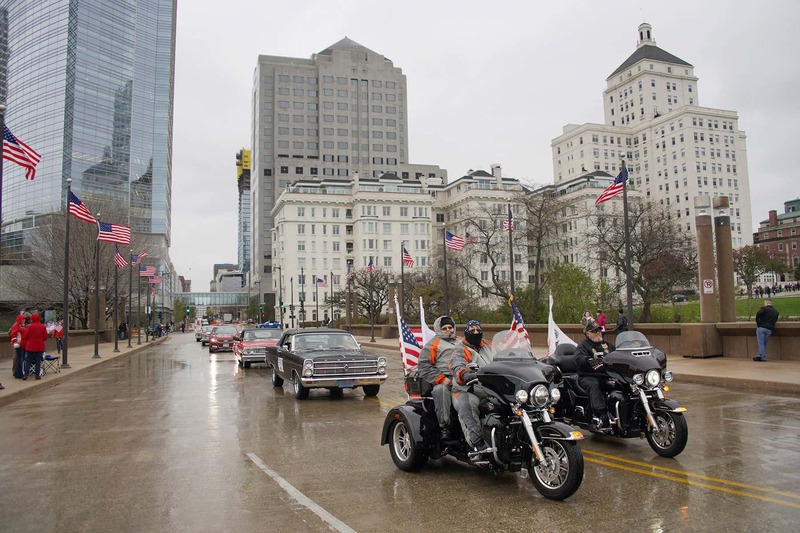 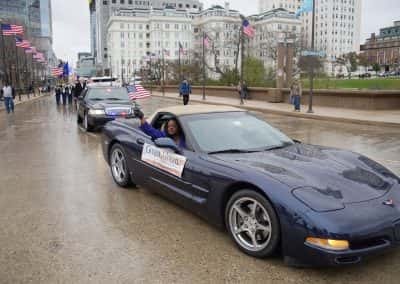 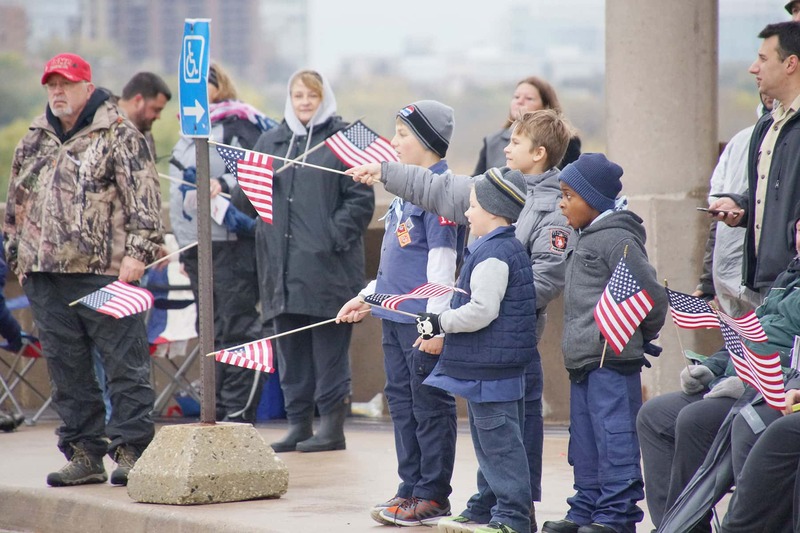 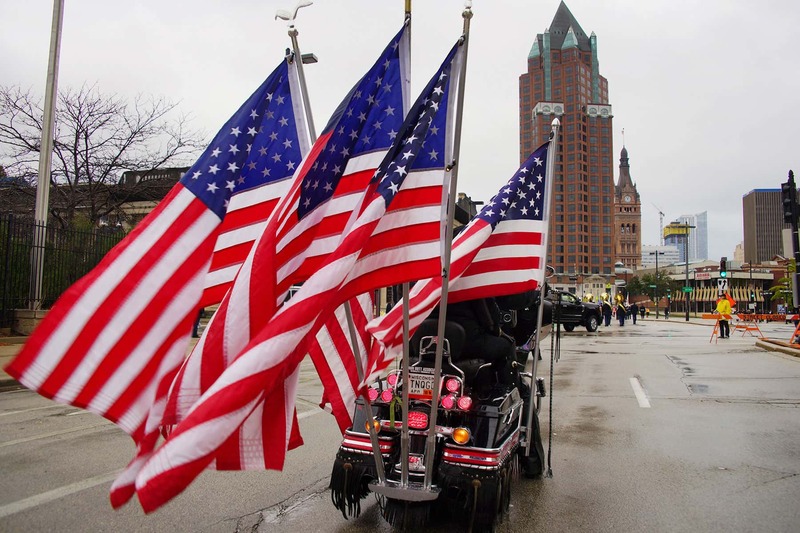 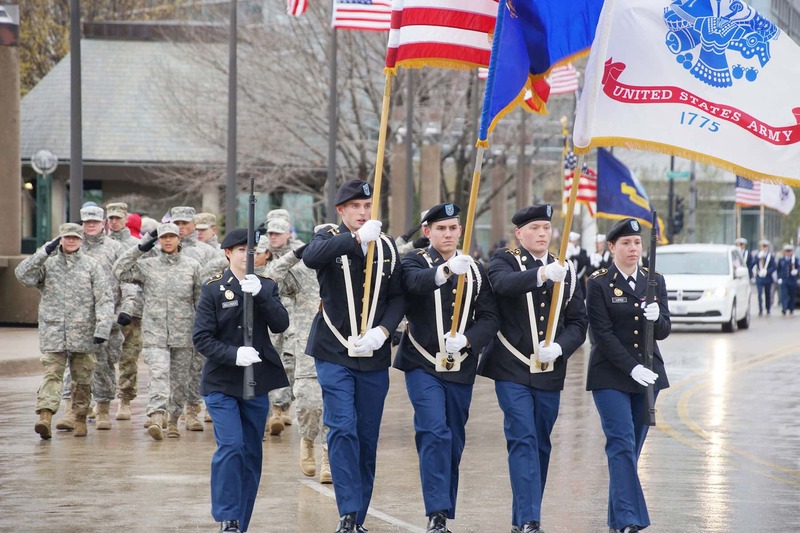 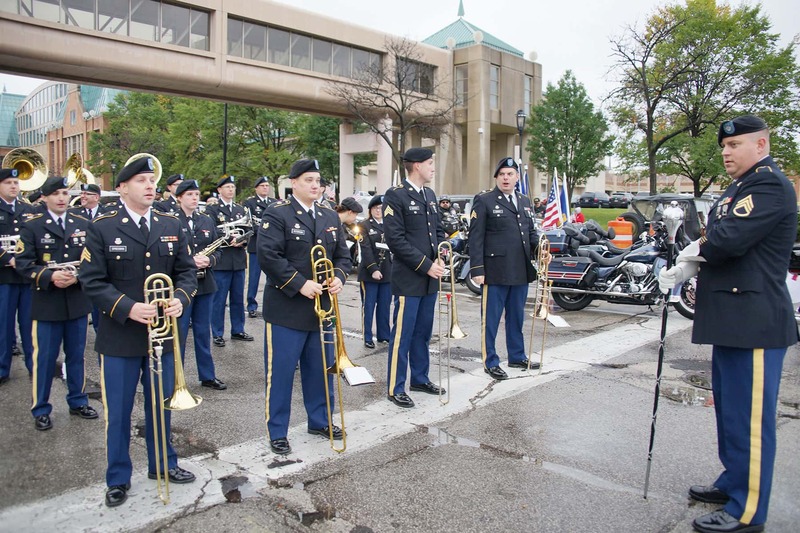 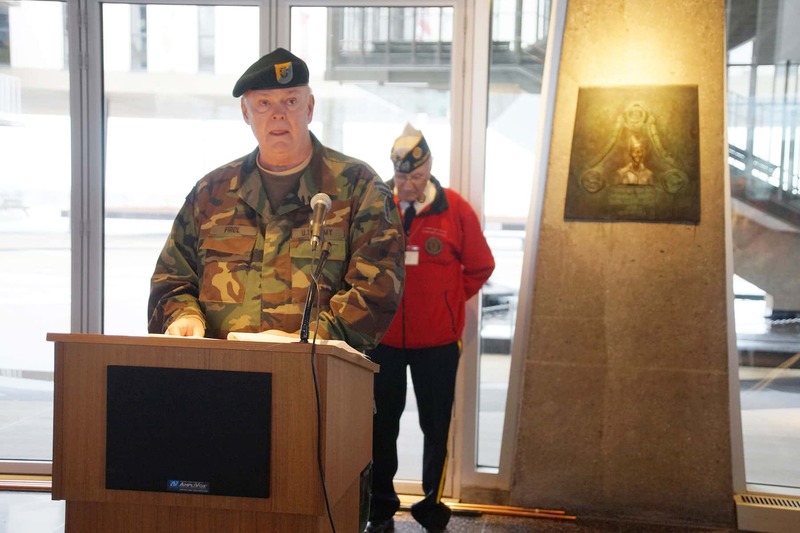 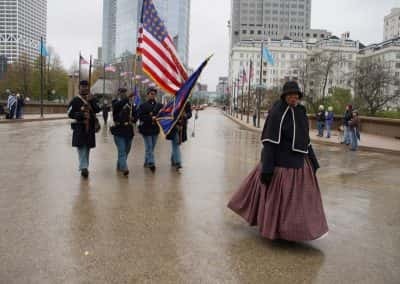 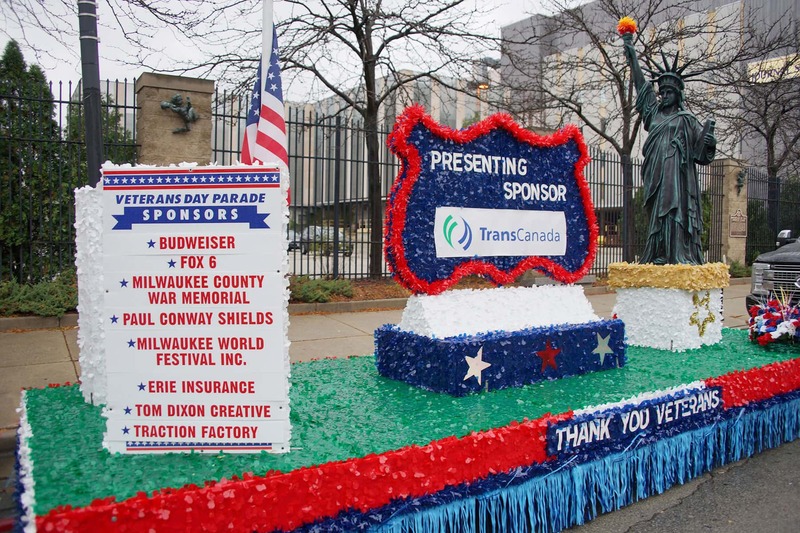 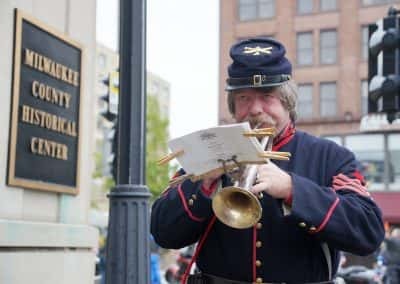 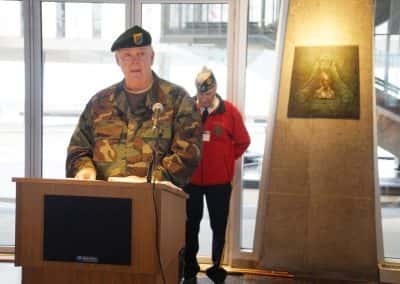 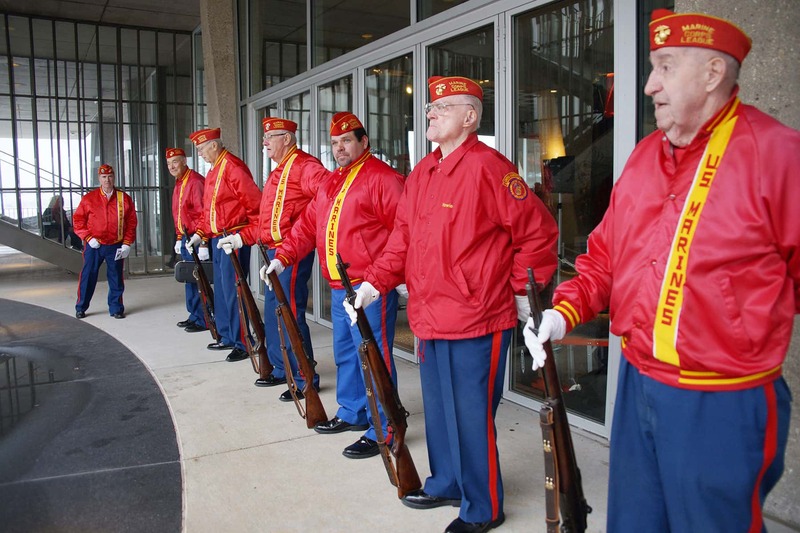 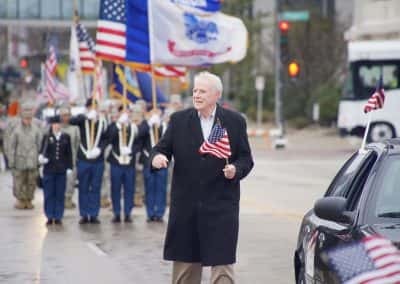 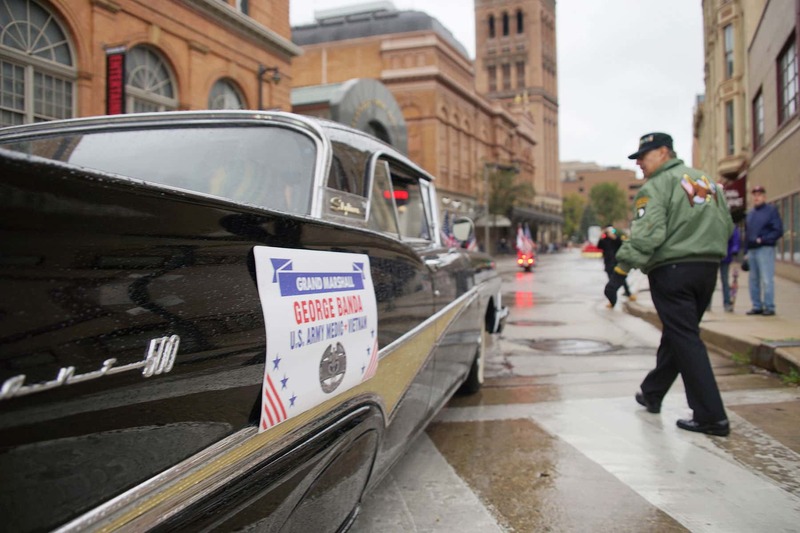 In its 54th consecutive year, the Milwaukee Veterans Day Parade and Day of Honor began at the Milwaukee County Historical Society and ended at the Milwaukee County War Memorial. 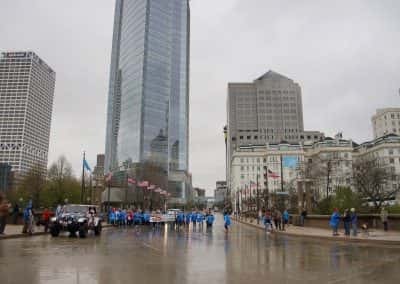 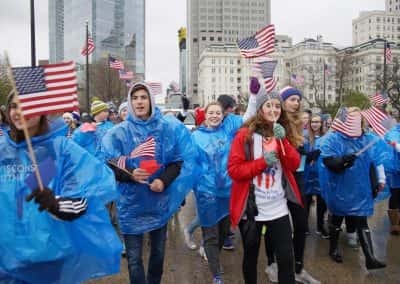 While the morning brought drizzles of rain prior to the event start, the march through the city proceeded unaffected by any wet weather. 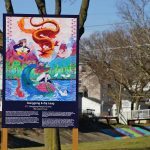 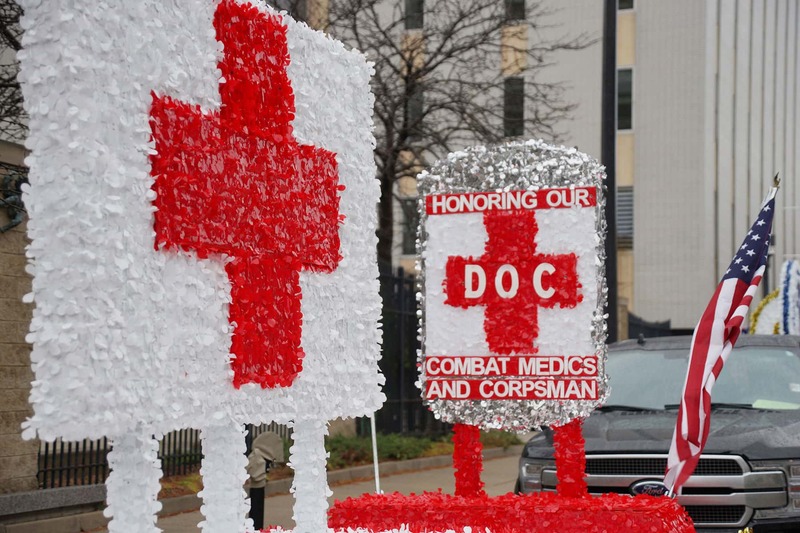 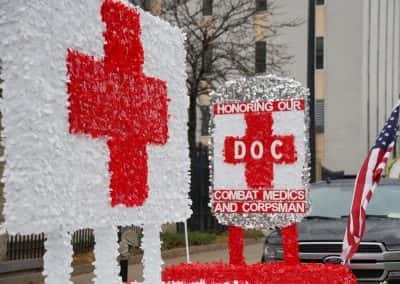 The special theme this year honored combat medics and corpsman. 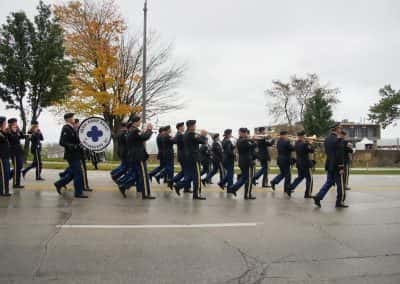 While troops under fire take cover during a firefight, these soldiers – trained in first aid and frontline trauma care – dodge bullets and rockets to save the wounded on the battlefield. 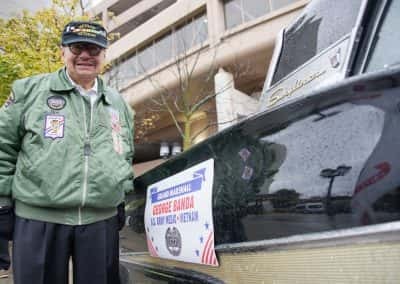 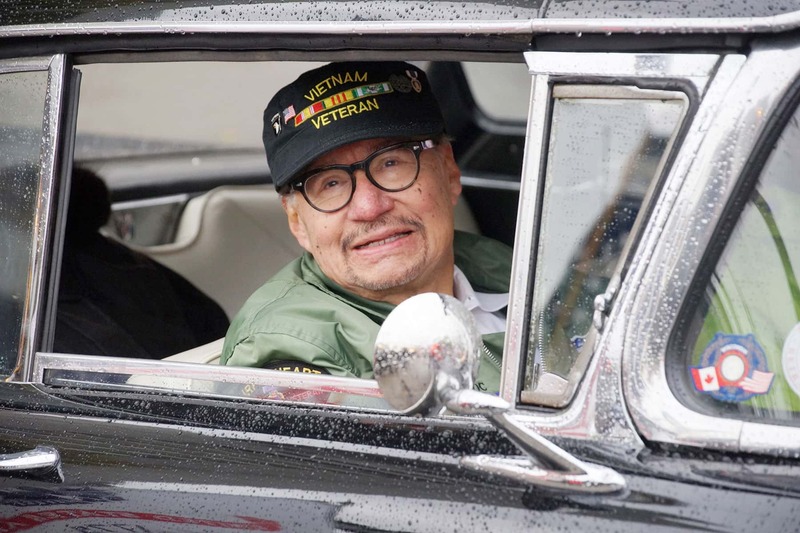 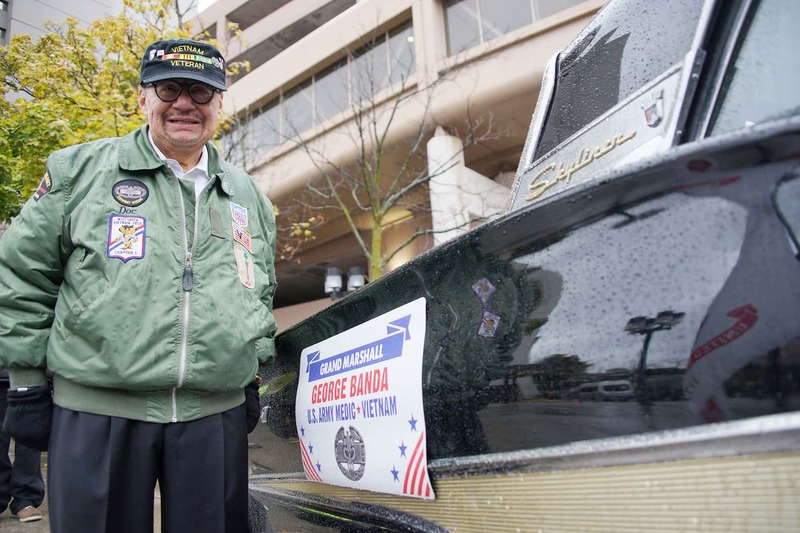 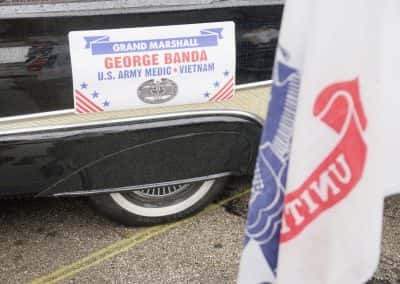 Grand Marshall for 2017 was George Banda, who served as a combat medic with the 101st Airborne Division in Vietnam. 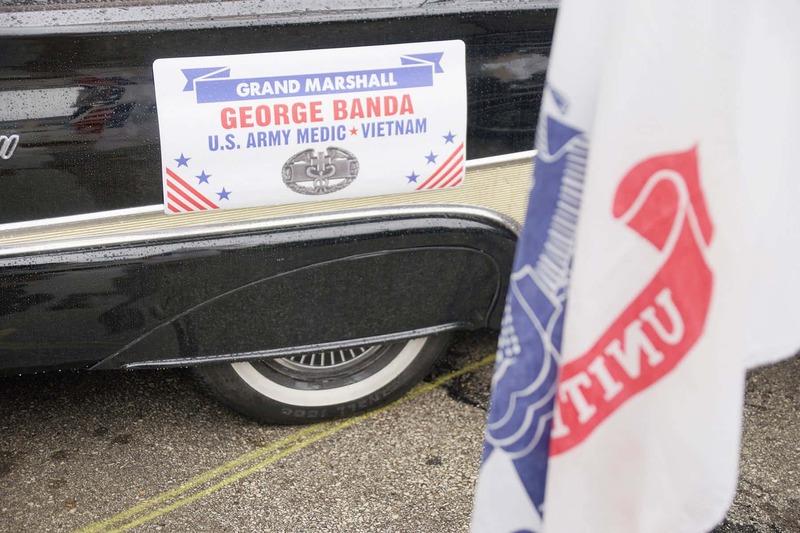 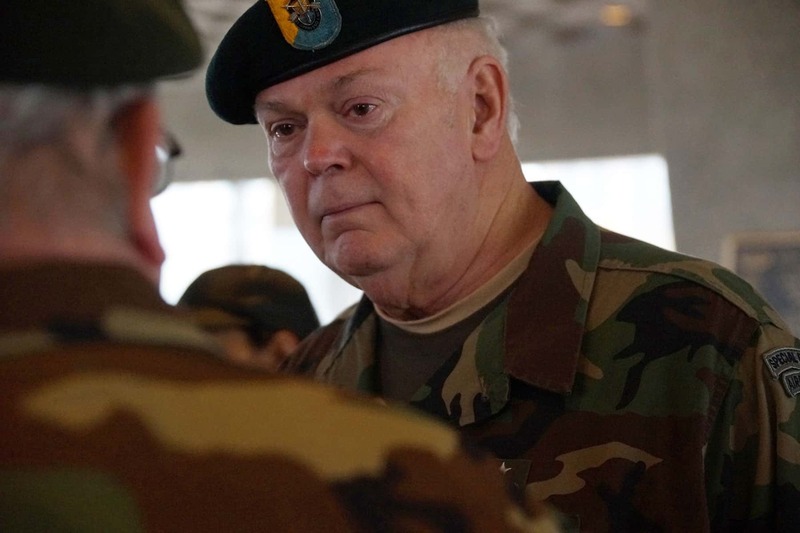 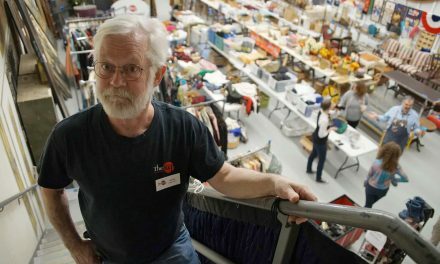 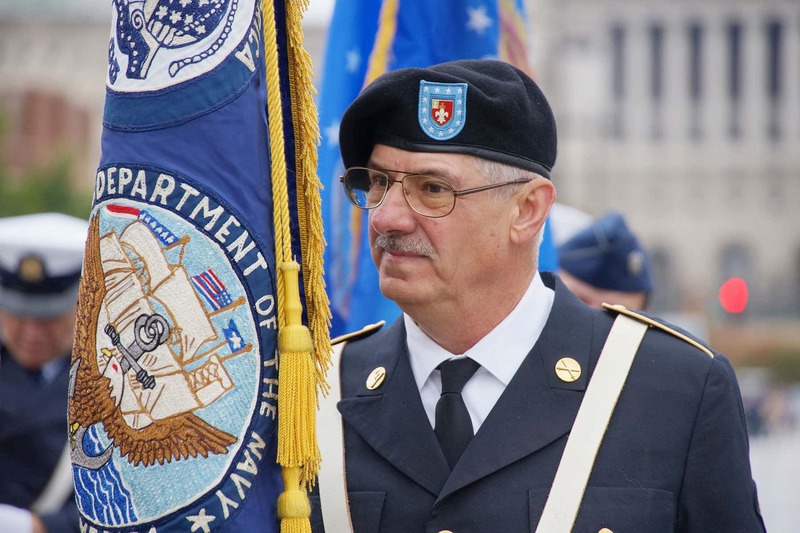 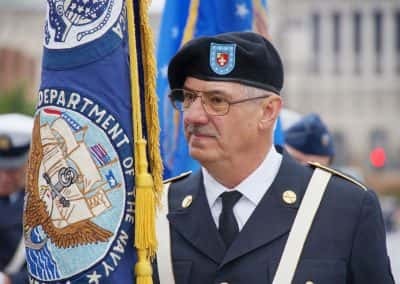 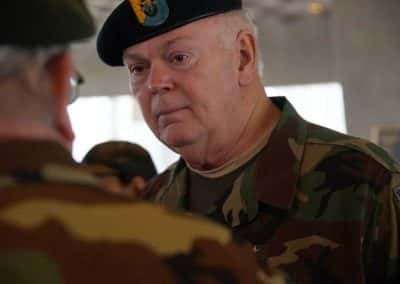 As a member of a recon company, Banda was awarded many distinguished commendations, including the Silver Star, Bronze Star, and the Purple Heart – a medal no one wants because it is only awarded for being wounded in combat. 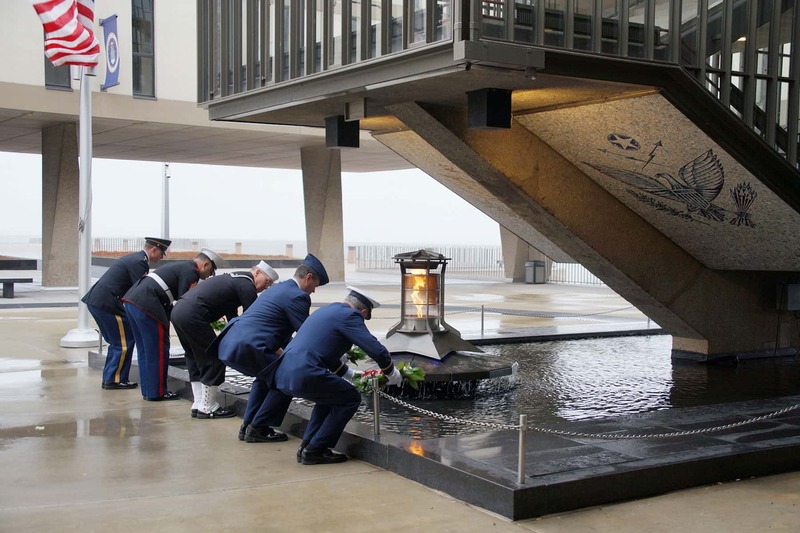 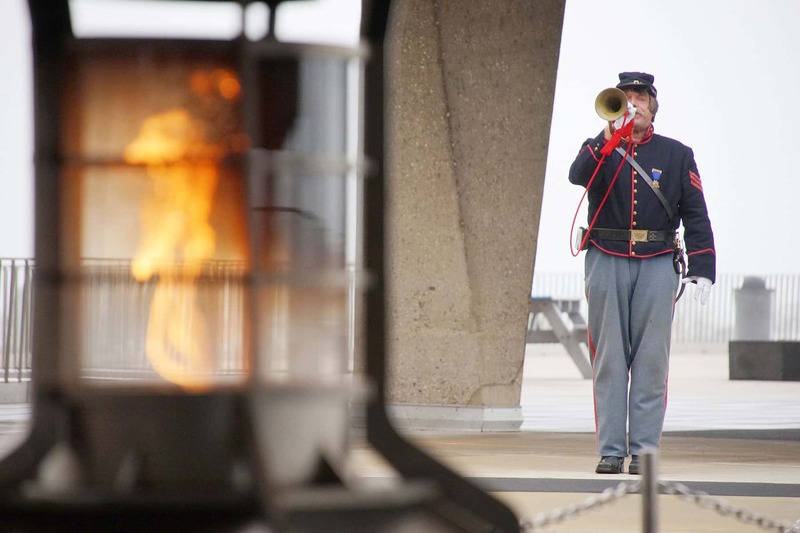 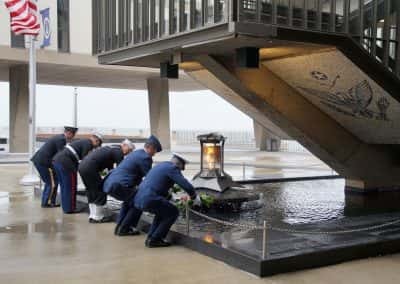 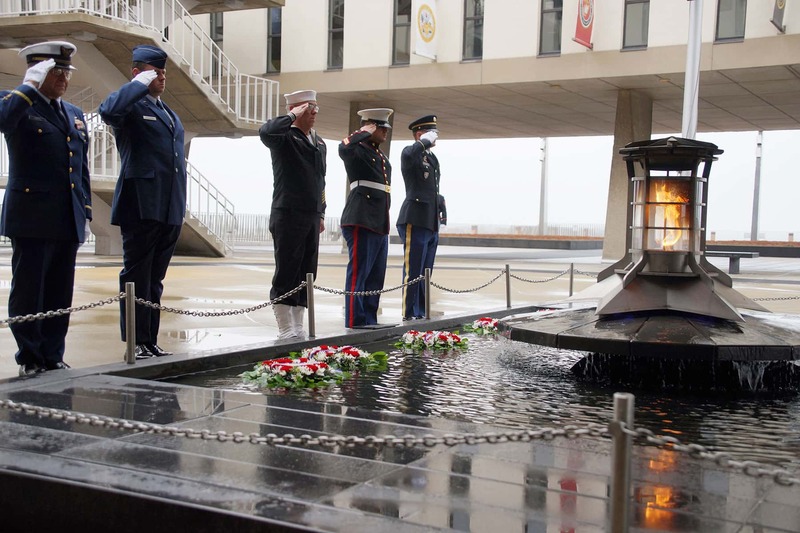 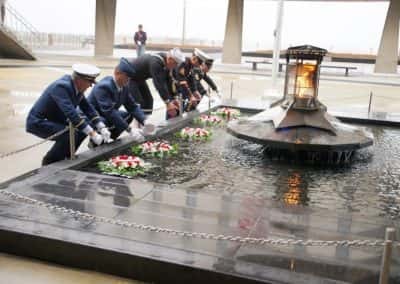 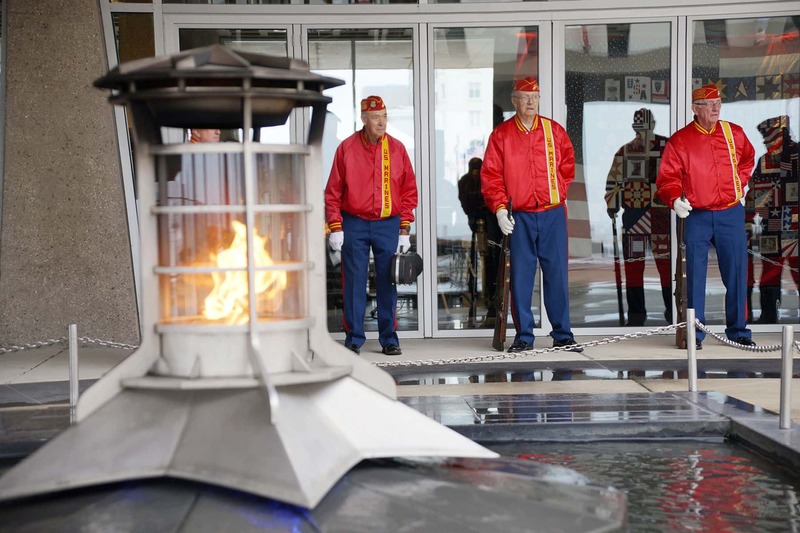 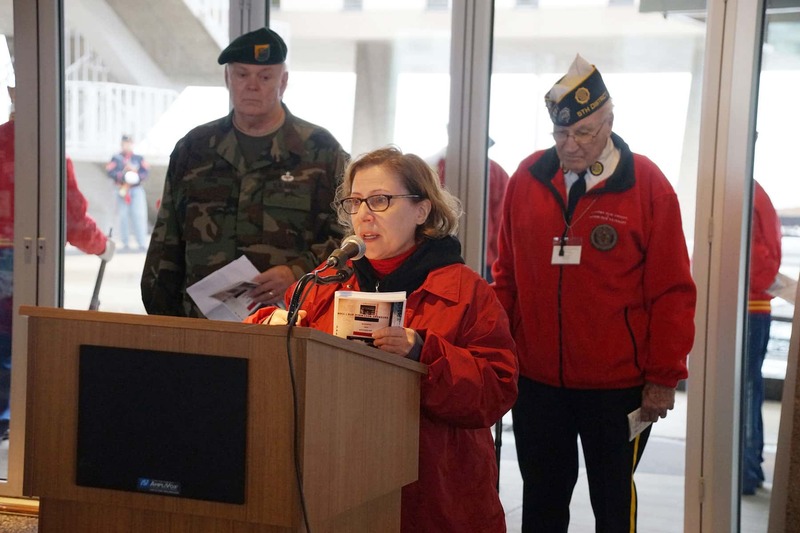 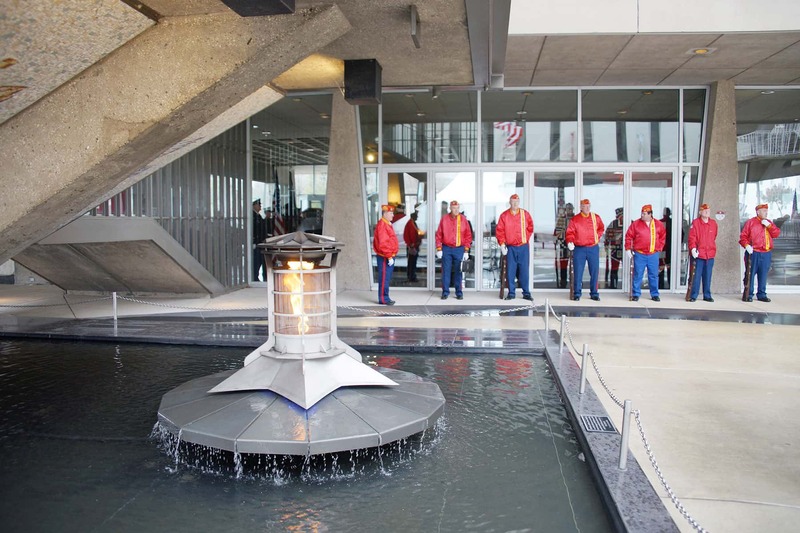 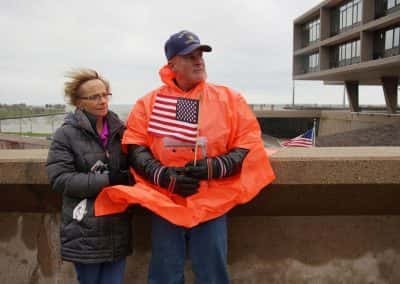 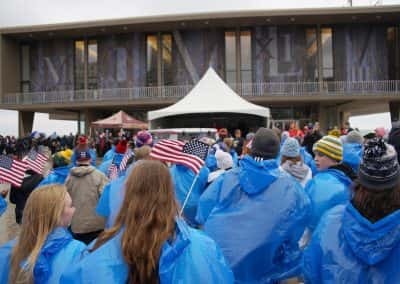 Following the parade, a memorial service was held at the Reflecting Pool to honor those lost in service to our country. 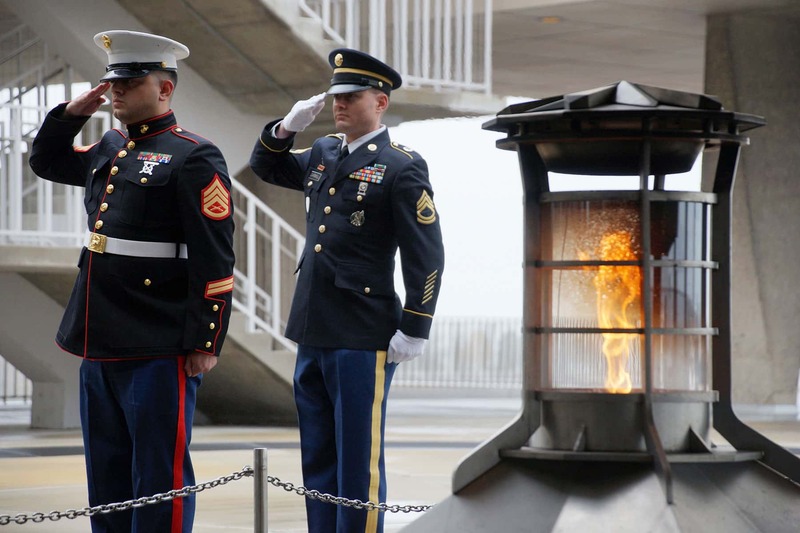 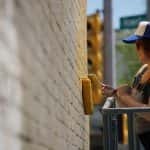 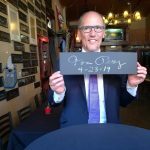 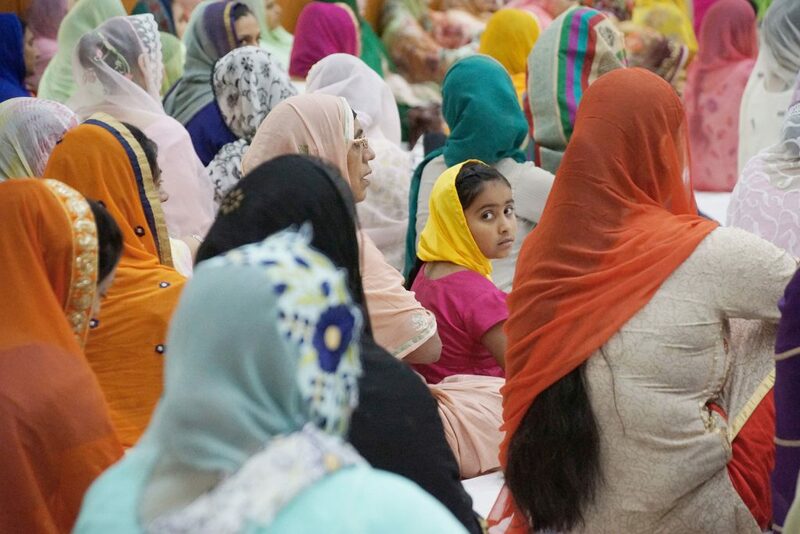 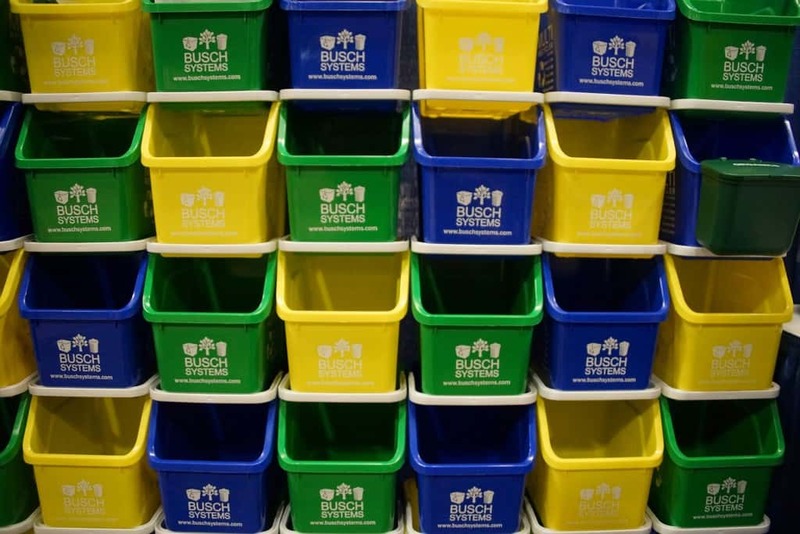 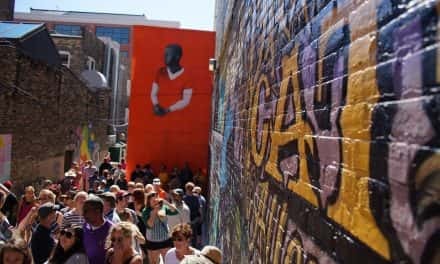 These images feature highlights from the day.